Are you a shoe girl, or a bag girl? I’ve always been a bag girl. I can own three pairs of shoes and they’re all black and almost the same, but bags? I could have bags for every occasion and a bag to match every outfit. 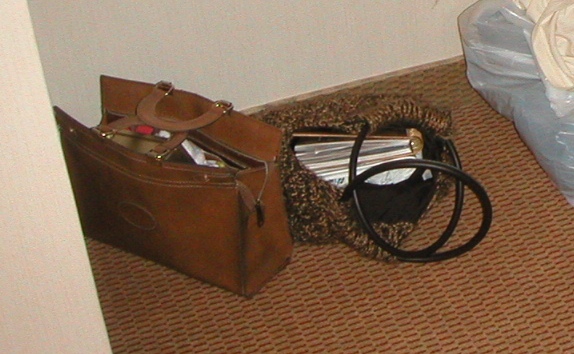 In fact, my handbags, at one time, took up four times the space of my shoes. Every few years—and many years before I started The Goodbye Project—I’d go through and clean out my tubs of bags without photographing them, which now I regret, although I’m certain there are many photos of old handbags I used to wear in the backgrounds of several photos. I kept one tub of bags with which I just can’t part—ones that are all in good shape. Here are the last few I’m letting go, and the memories associated with them. They’ve already been donated, but I’m proud to say each was in very good shape enough to donate. I don’t ever donate stuff that ripped or grubby or damaged, so whoever gets any one of these should be pleased—each one has a lot of life left in it. Dad always filled our stockings every Christmas (I have to admit, the last few years he was alive I was filling all the kids’ stockings and he was filling mine, although a couple of years I bought stuff for myself and stuffed my own). He gave me this case for Christmas in 2006, and I carried it for a few years until it split apart. Because it was his last Christmas when he was able, I just couldn’t bear to throw it out, so I kept it for awhile. Now it’s time to let go. I tossed it. 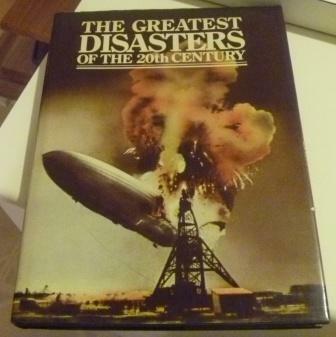 It was in terrible condition and I couldn’t in good conscience give it away. 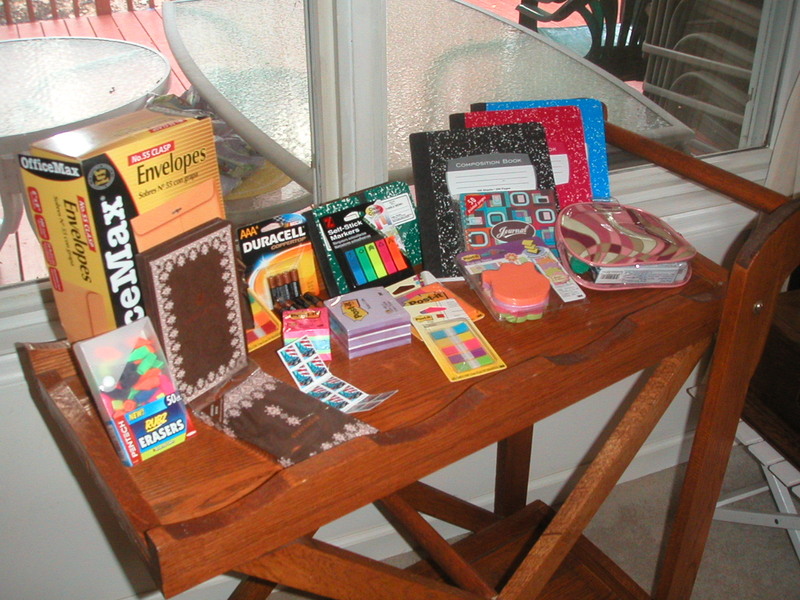 Here’s the case with all the other stuff I got from Dad. 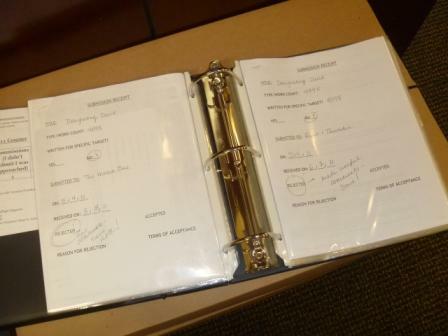 You can see the case was filled with items—travel-sized shampoo, conditioner, some band-aids, and the like. This was one of my favorite bags; I bought it in 2001 at Old Navy, and it became a favorite, especially during Fall and Poe season. 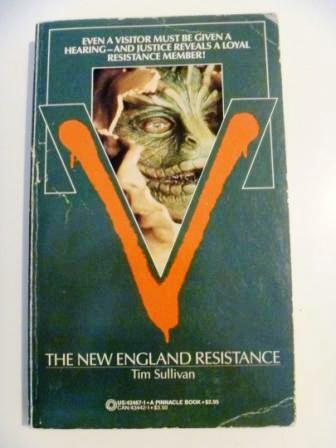 It was especially appropriate for autumn in New England. 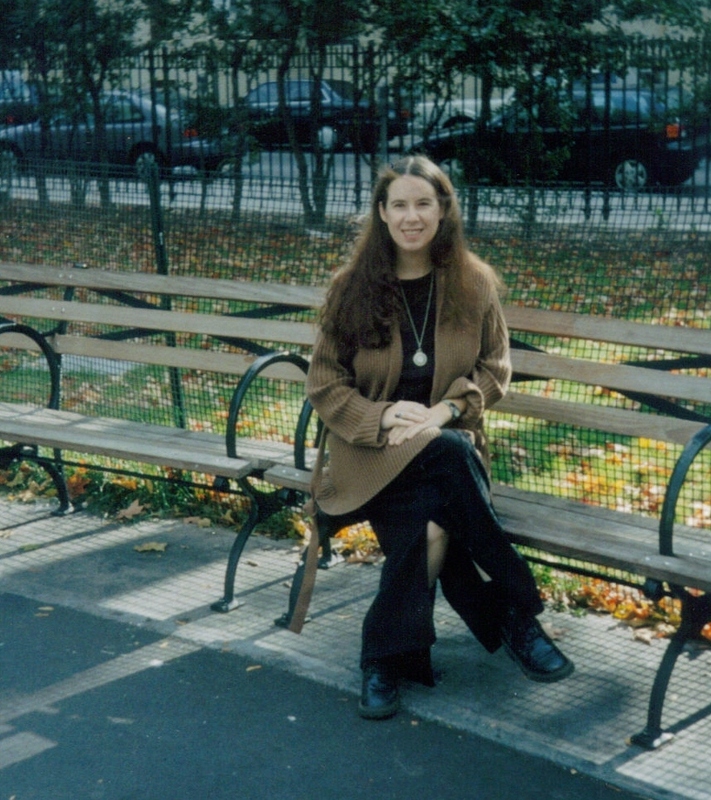 Me, November 3, 2002, at Poe Park in the Bronx. I had gone to visit Poe’s Cottage and was carrying the sweater bag that day. At that time, the bag was new—I think I’d only owned it for a couple of months, which would make sense, because Old Navy’s Fall line probably would have been out in late August. I loved the bag so much I carried it through the winter. 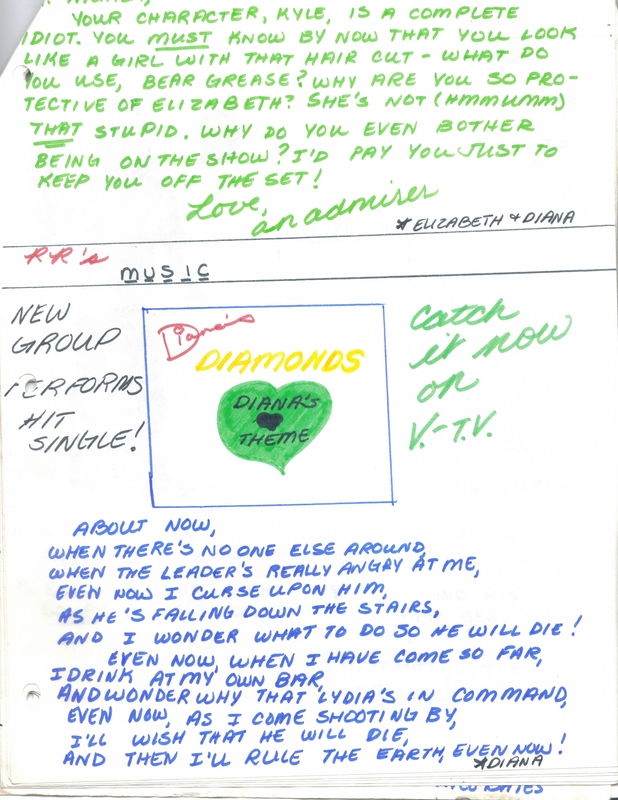 Here it is on February 23, 2003, in a hotel room in Mystic, Connecticut. It was my annual Fear & Loathing birthday weekend at Foxwoods or Mohegan Sun, I forget which one we did that year. 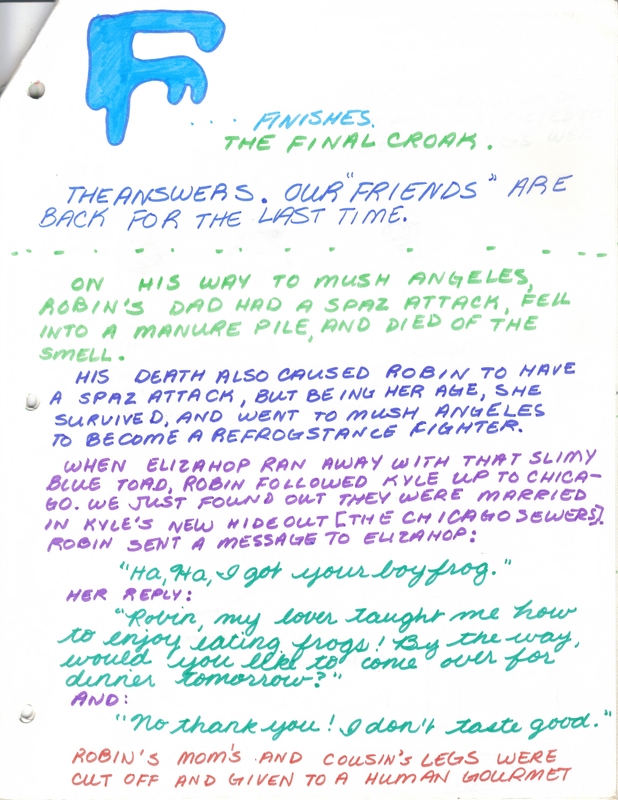 You can see there’s a journal inside it—I never went anywhere without one at that time in my life. Turns out the sweater bag was lucky! I won a couple of hundred dollars that weekend at the slots. This was when they still took quarters (now, everything is on a card). 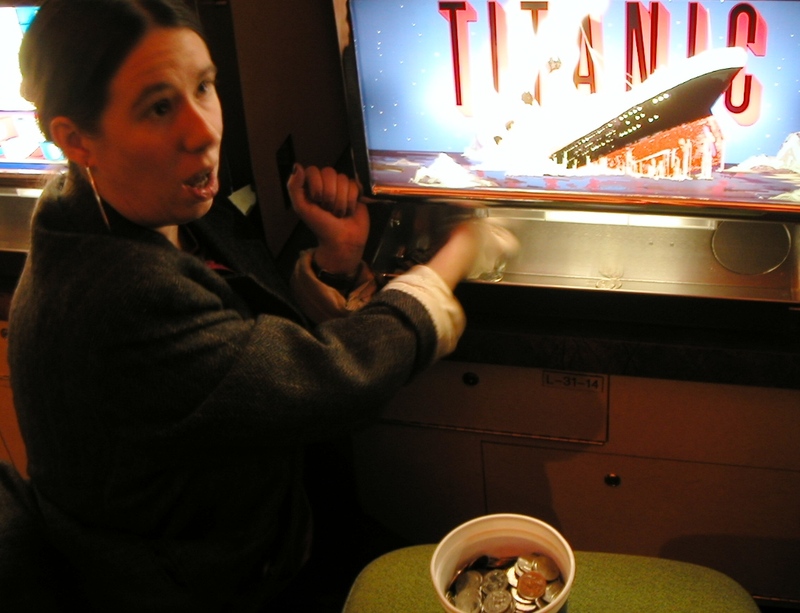 It’s fun to win still, but it’s just not as much fun as seeing all those quarters come flying out of the machine. 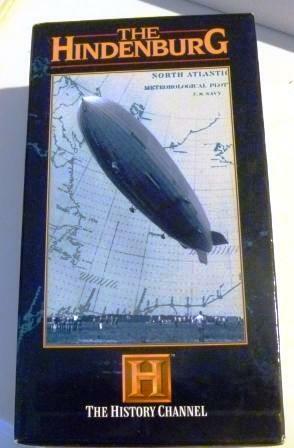 Notice I won on the Titanic game—I have an obsession with Titanic, and we’ll be talking about that in future episodes. This was taken Sunday, February 23, 2003. 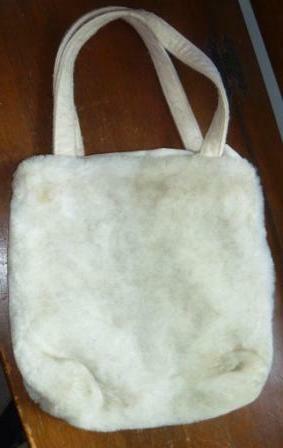 I loved this fur bag. I purchased it at Old Navy probably after Christmas in 2000, and the only reason I say that is because I know it was a winter favorite in 2001. At that time, I had a faux fur coat, and this was a perfect match. 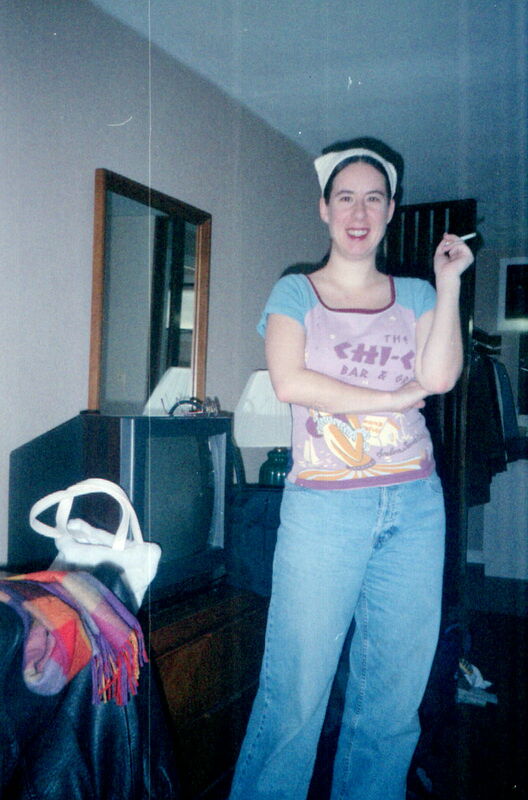 Me in 2001 in a hotel room in Mystic, CT. 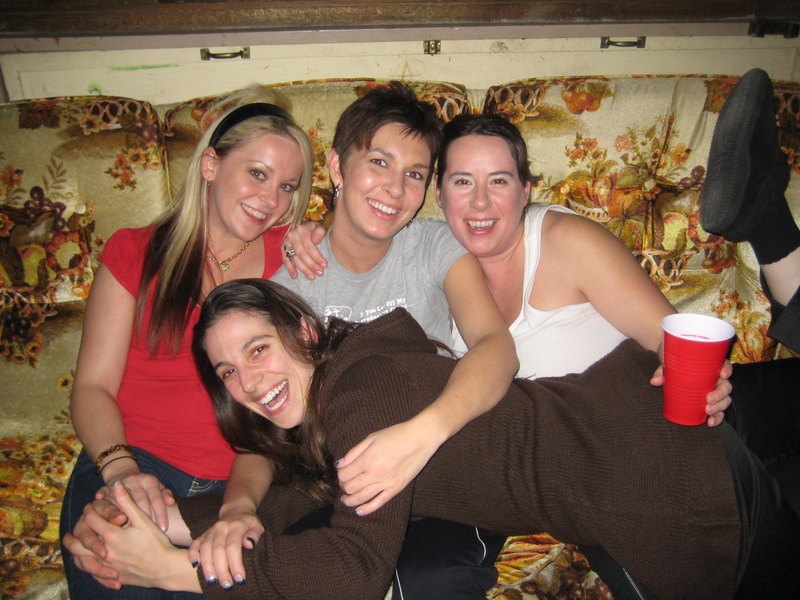 This was another of our famous Fear & Loathing weekends—we’d go to the casinos to celebrate my birthday. This was just before dinner February 2, 2001—we ordered pizza from Angie’s, which is a really great pizza place in town. You can see the fur bag at the left of the picture. That same February weekend in 2001, only this was on the Saturday, just before we went out to hit the casinos. 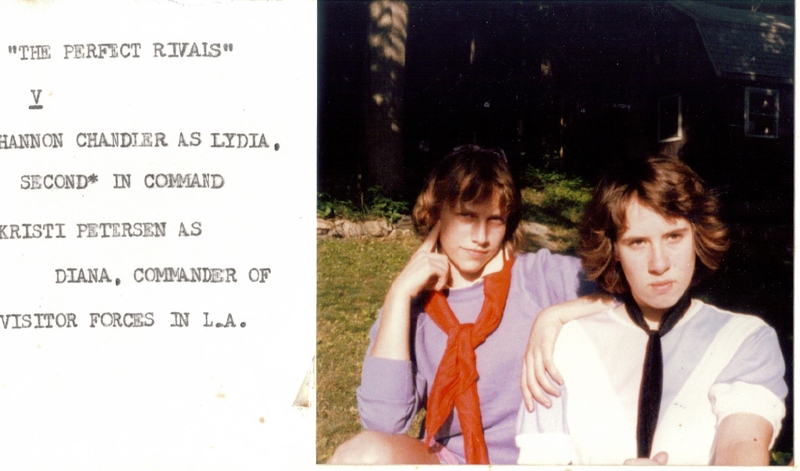 The fur bag is at the left of the photo; behind it, my red IBM Hunter Thompson typewriter. Yes, I even traveled with that damn thing. Part of the reason I was probably attracted to the fur bag was because it reminded me of something a woman might carry in the 1960s. At that time, in the early 2000’s, winter was a big deal in our house, and on snowy nights we’d spend time watching a lot of those old turkeys like Winter-A-Go-Go (my favorite) and Ski Party. 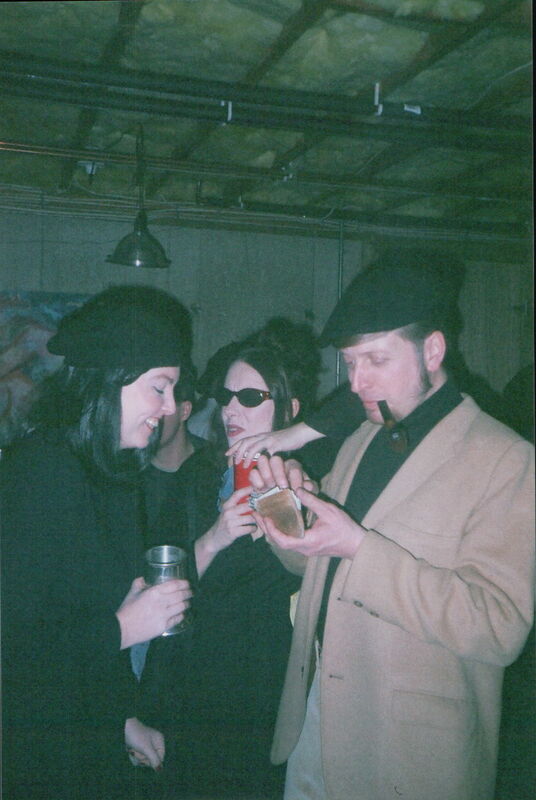 Above, Heather, me, and Walter, at right, at the annual Beatnik Party that was held every year up at one of our friends’ houses in Bridgewater. I was carrying the fur bag that night; it was the perfect compliment to my outfit. Photo taken March 1, 2001. 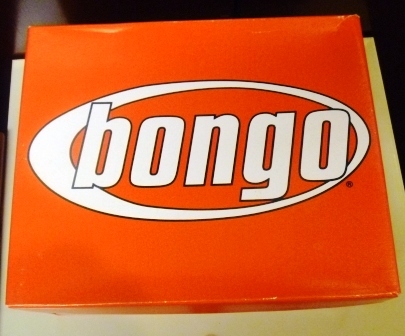 In the early 2000’s, just as there was an annual Beatnik Party, there was an annual Winter-a-Go-Go Party. 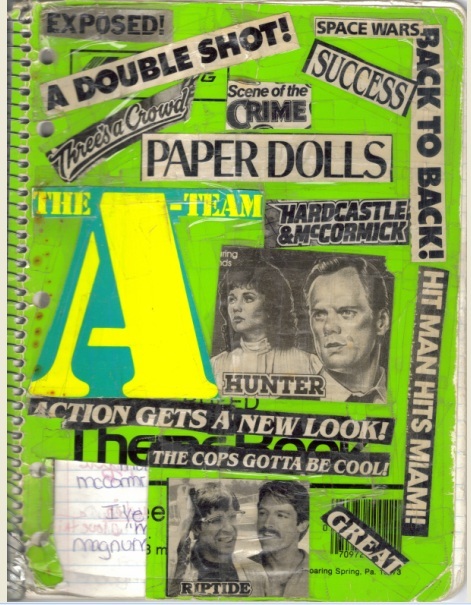 The Go-Go Party was usually in January; the Beatnik in February or March. 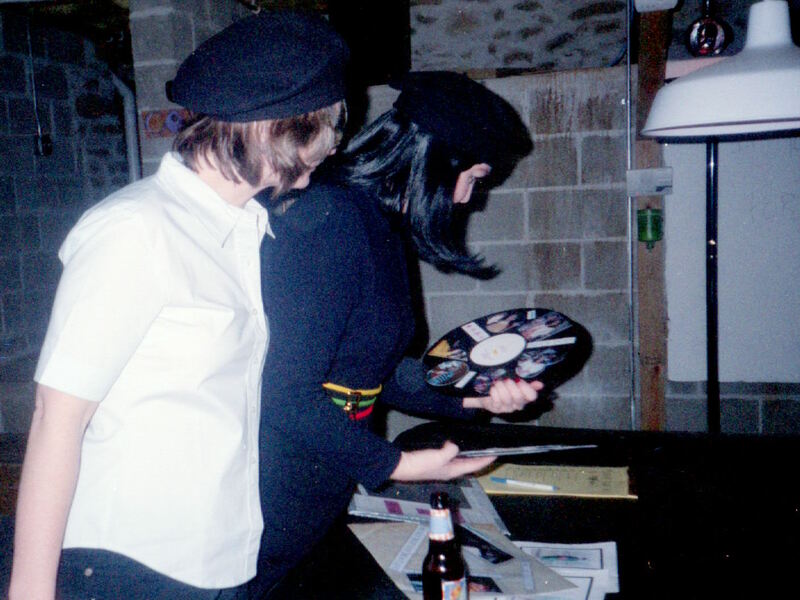 Here, at 2001’s Beatnik Party, Heather and Holly check out the “record” set I made—basically, a scrapbook of that year’s Winter-a-Go-Go party in the form of records. 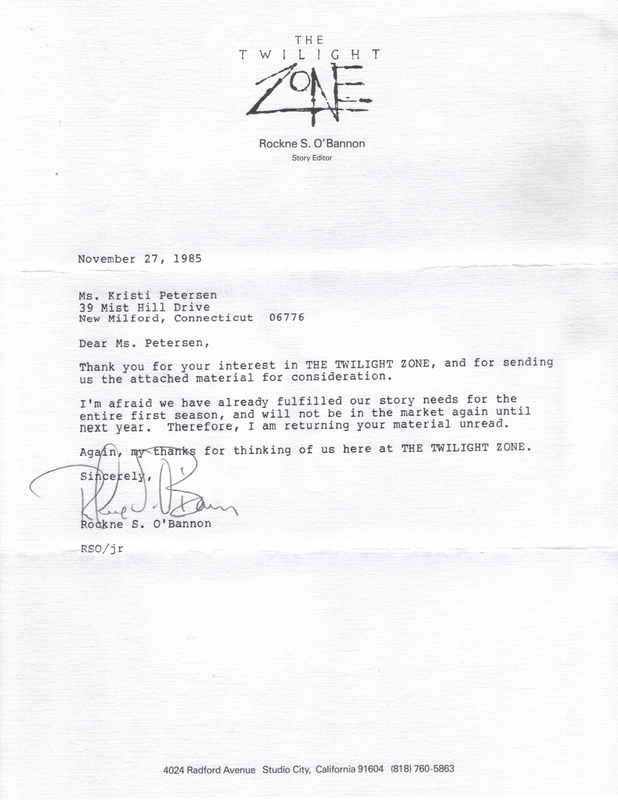 I carried the fur bag to the Winter-a-Go-Go party that year as well. 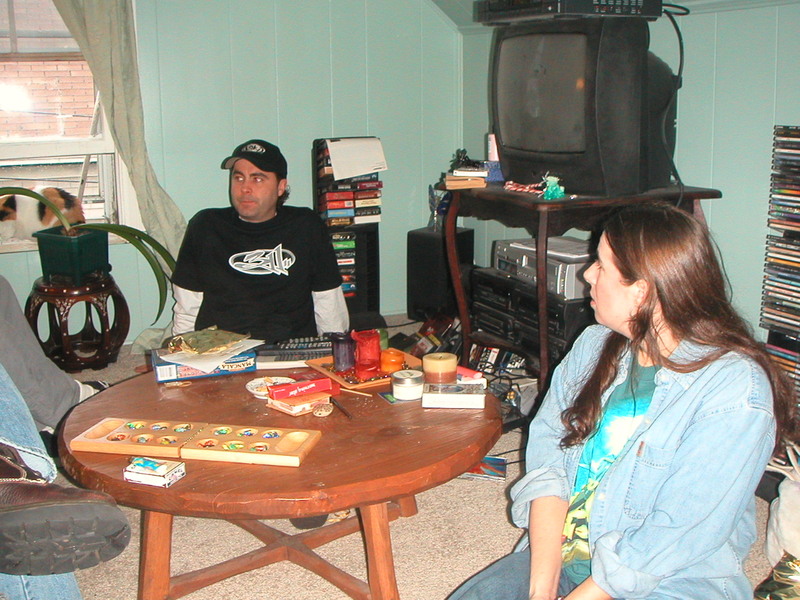 Here I am in Kaitlyn’s house with John of Loki Graphics, New Year’s Day, 2003. If you look behind me, you can see the fur bag—it was, along with a small tote bag, all I brought. Charles and I were hanging out on New Year’s Eve by ourselves, we called Kaitlyn, and she said, ‘get in the car and come here.’ So we did. It was totally last minute; we were out of the house and making the two and a half hour drive in just under 10 minutes flat. It’s one of my happy New Year’s Eve memories. 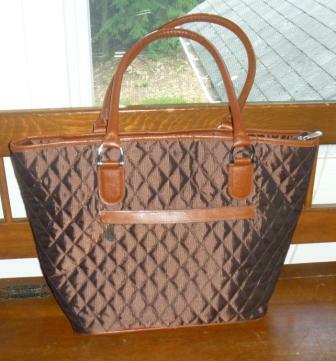 I loved this brown quilted bag; I acquired it in early 2007 and used it up through late August 2010 as my main handbag—when I went and bought an alligator-pattered laptop bag to use, because I was tired of not being able to grab stuff—I’d always have to dump out my whole bag to find what I was looking for, and with the publication of Skeletons in the Swimmin’ Hole—well, my already limited time became even more limited, so I needed to get more organized. 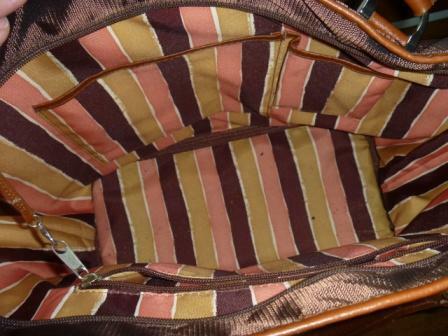 The bag is still, though, in awesome shape—you can barely tell it was used for three years as an every day bag. It went to Goodwill. 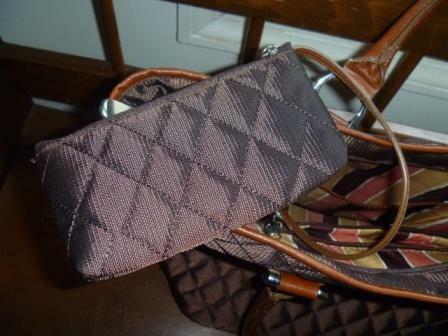 One of the neatest features of the brown quilted bag was its detachable matching wallet. 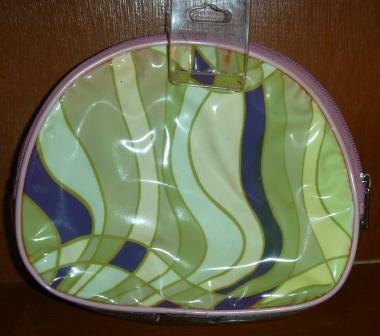 I also liked the lining on the bag. It is, even after three years of use, in mint condition. March, 2007. The quilted bag was brand new then, and it came in handy because it was not only big enough to carry all of my every day essentials, but also tall enough to hold files I might need for writer’s group or meetings—therefore, I didn’t have to carry a separate tote. 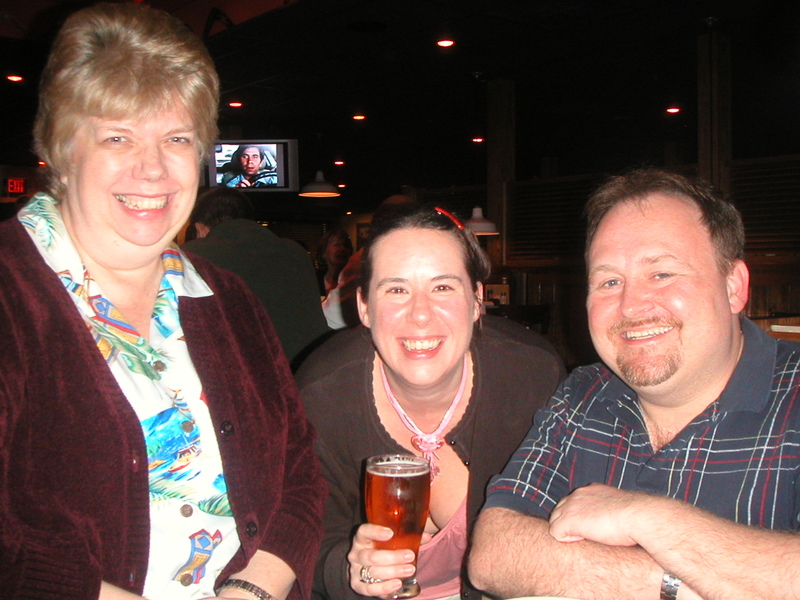 Above, Carol, me, and David Roberson knock back a couple of cocktails after a Pencils! Writers’ Workshop meeting in Wilton, CT. 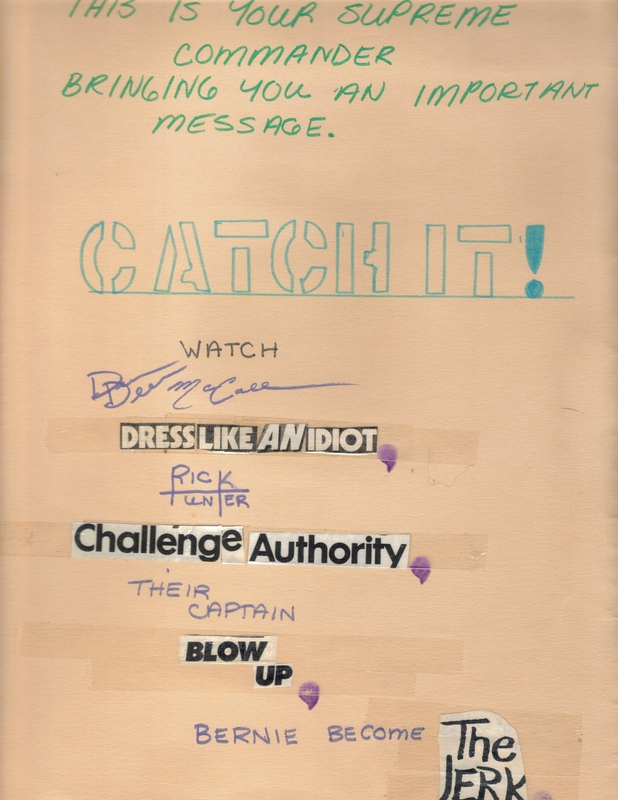 I really miss Dave—he passed away a couple of years ago. 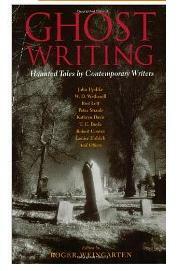 He was not only a talented writer, he was a good friend. I associate this bag not only with Pencils! Writing Workshop, but with him. So it is a little tough to give it away. 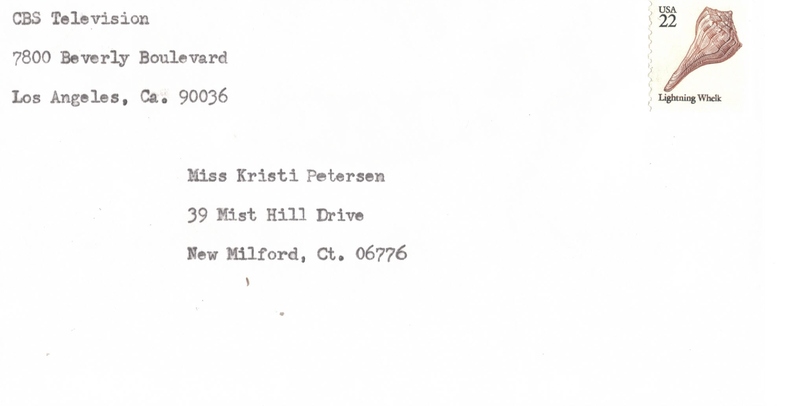 I headed to Goddard College in Plainfield, Vermont, in the summer of 2007 to begin my graduate program in Creative Writing. The brown bag, of course, was with me—even though I had to adapt, after eighteen years, to walking all over a huge campus again, so it mostly sat in my room unused in favor of a backpack. 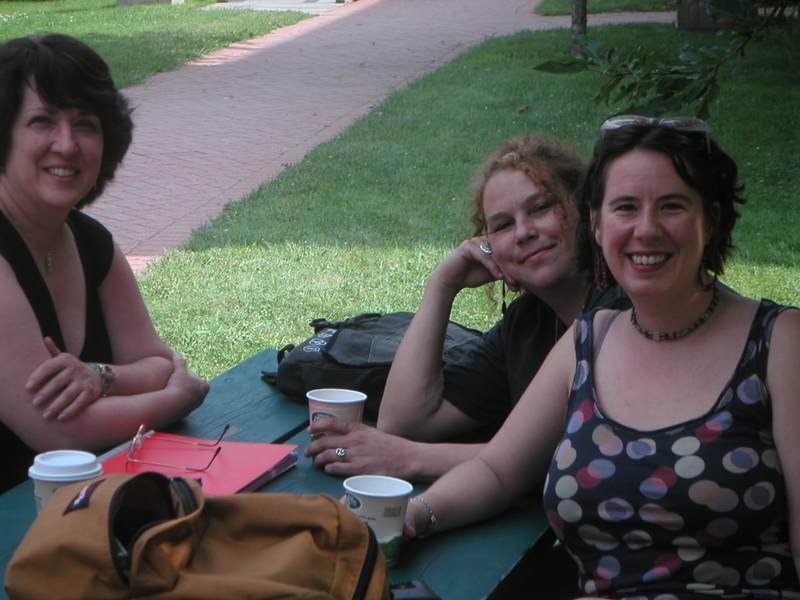 At left, McKenna, my dear friend Cyn (who passed away in December 2010), and me take a break on a hot summer day. 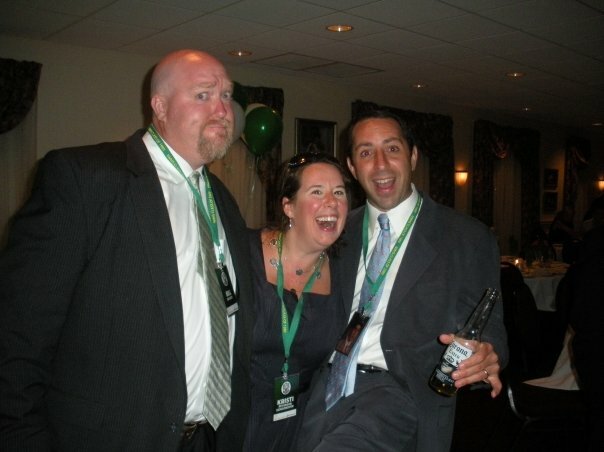 That was the moment the three of us met, actually. Another reason I’m having a hard time letting go of the bag. But you know what? I’m moving to Florida. I just won’t use it again. 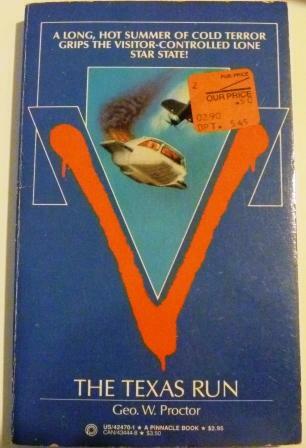 Oh, man, is this ever soooo 1980s. I made this purchase on purpose—I wanted something 80s-ish to wear to my 20th High School Reunion in July of 2009. Why silver? Well, it also had to match my navy blue dress. I had silver shoes and a necklace too. 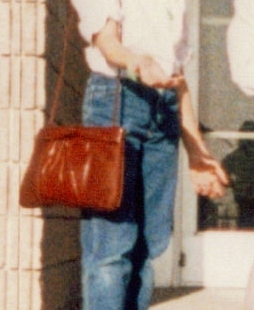 But the real reason I chose this style is because I had a maroon bag back in the mid-1980s—which I referred to as my DeeDee McCall bag, because it reminded me of the bags that character from the TV show Hunter carried—that had exactly the same style of flower and ribbed top. 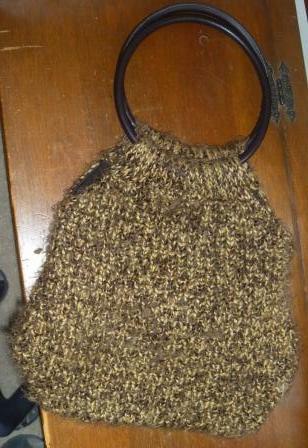 Here’s the “DeeDee McCall” bag I mentioned in the last caption. Here, it’s being carried by my friend Emily, as she was playing the role of McCall in a scene we were doing to pass time waiting for our parents to pick us up from chorus practice after school. If I had to choose a “favorite bag of all time,” this bag was it. I was heartbroken when the strap broke and I had to get rid of it. This was taken in March of 1985 outside Schaghticoke Middle School in New Milford, CT.
Billy Buckbee, me, and Greg at the New Milford High School Class of 1989 20th Reunion at Anthony’s Lake Club in Danbury, July, 1989. 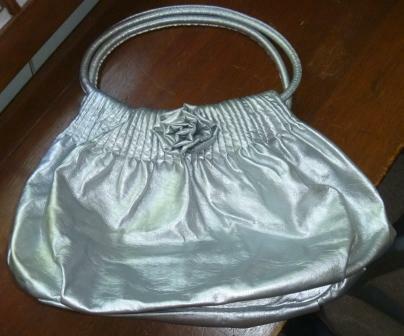 It was the only time I used that silver bag—whoever gets it will find it in mint condition—but it’s still hard to get rid of because that was a very magical night. 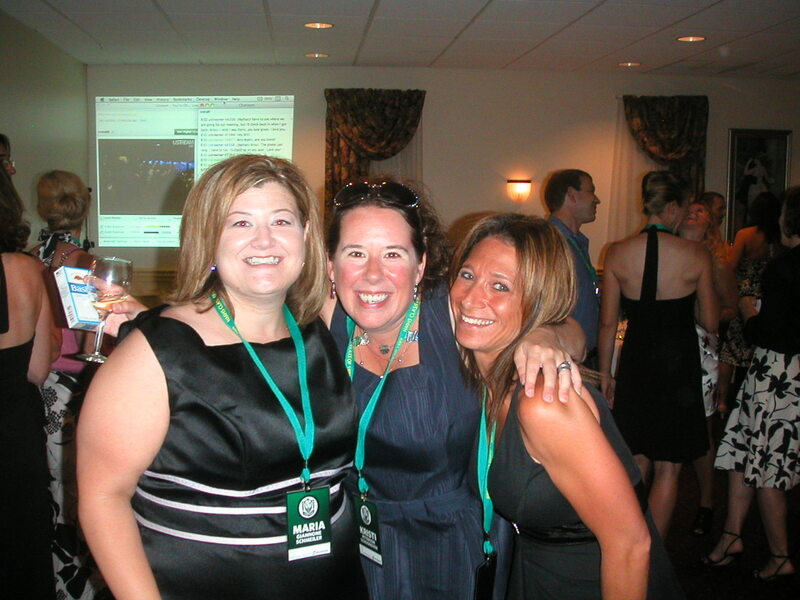 Maria Giannone, Me, and Melissa Poodiak at the New Milford High School Class of 1989 20th Reunion at Anthony’s Lake Club in Danbury, July, 2009. There’s an interesting story behind this one. 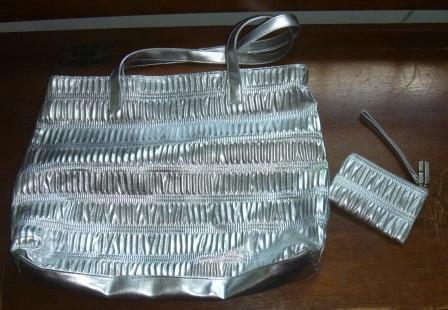 A friend of mine purchased a gift for his wife for Christmas, 2008—cosmetics or jewelry, I guess—and this bag and purse set came with his purchase. He knew his wife wouldn’t go for it, but knew I would (“you like all that flashy retro stuff,” he said). Of course I was thrilled to get this, and it was my winter 2009 bag—I used it for going out and when I didn’t want to carry the big huge brown quilted bag anyplace. The small purse was perfect for carrying business cards. 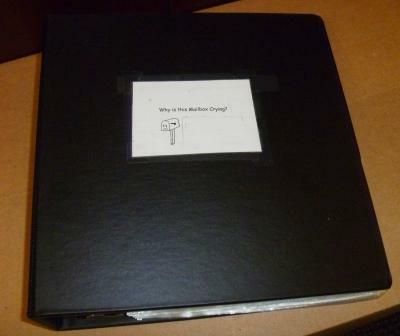 Here it is on the bed in my dorm room—Giles 3—up at Goddard’s Winter Residency, January 4, 2009. That was a unique residency. First of all, it was HELL IN THE SNOW. Every time we turned around it was snowing again. We could barely get off campus, it was gray, it was cold, we had a leak in my dorm room (because some idiot decided it would be wise to design the Village Dorms with flat roofs—seriously? In Northern New England? What was he smoking? 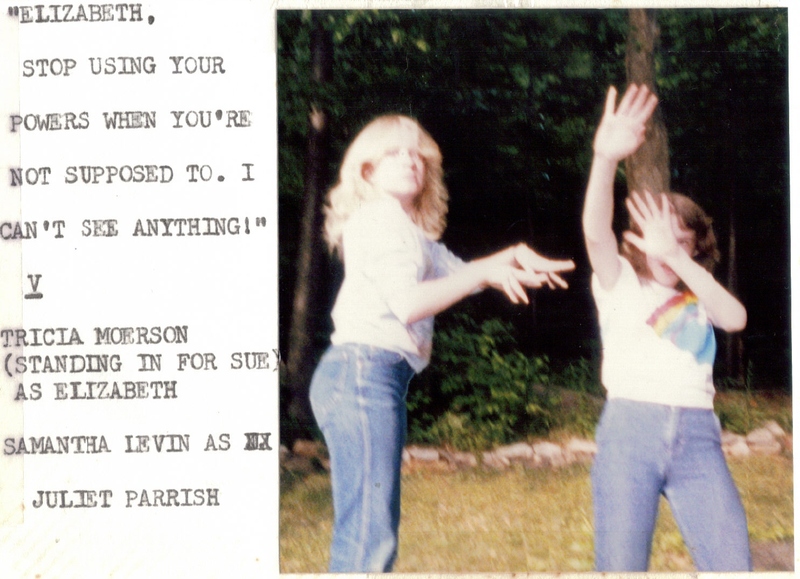 )…but we also threw the best graduation dance ever—Cyn, me, and Julia did the shopping, so there are lots of funny stories about Cyn (from down south) driving in the snow, the people at the supermarket not knowing how to count, and icing down the shrimp with fresh, clean snow because we’d forgotten to buy ice. The bag accompanied me on that very special day, so those are the associated memories, and being that Cyn is gone now, it’s harder to let this go than it would normally be. 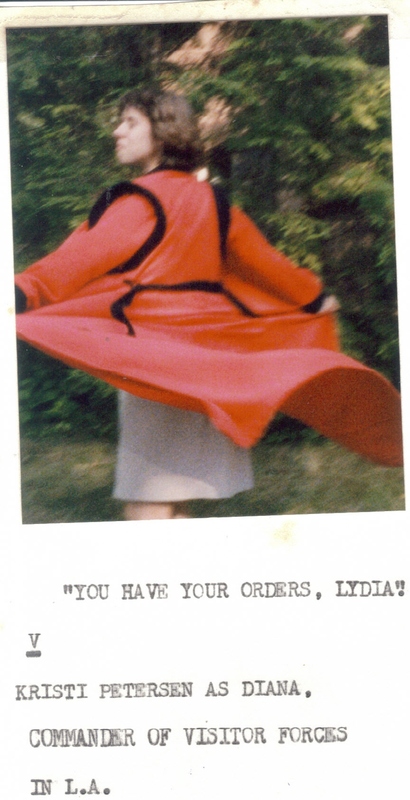 As a treat, here’s what that winter up at Goddard’s January Residency 2009 was like. One good thing about being in SNOW HELL was the opportunity to drink—and then do stupid things like sled as though we were ten years old. Here’s one early afternoon impromptu sledding party. The snow was literally up to our knees. It was hard for everyone to walk, let alone haul the sled back up the hill. Joining me are my friends Charles, Joe, and Julia—and there are a few other classmates as well, but they’re not in the video. 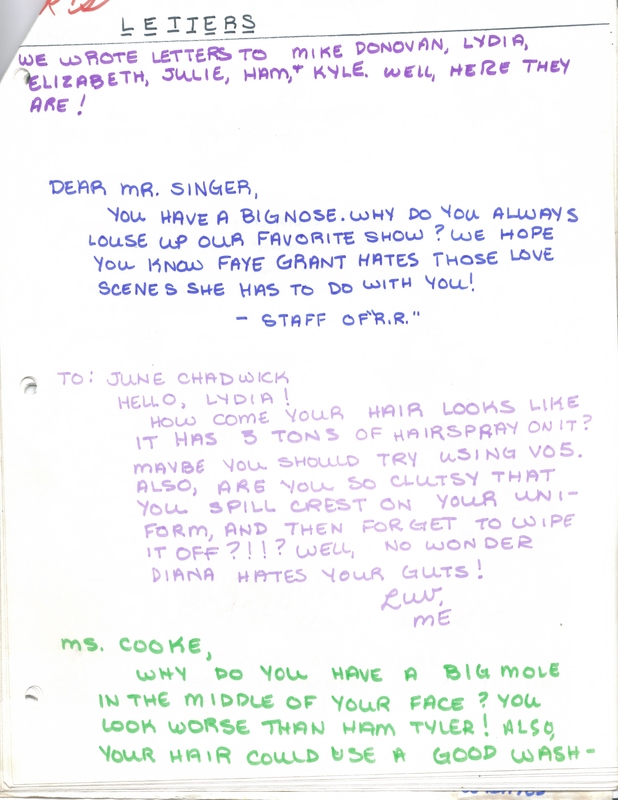 The women of Giles. 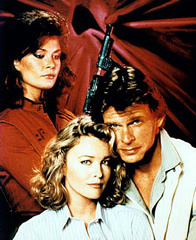 Left to right, Julia, Julie, me. Amy is across us. Yes, we’re all in lighter clothing, but trust me when I tell you our dorm was hot all the time—some of it might have had to do with the fact that Goddard was doing this experimental program in which they were heating some of the dorms using “recycled” vegetable oil from fryers in Burlington restaurants. 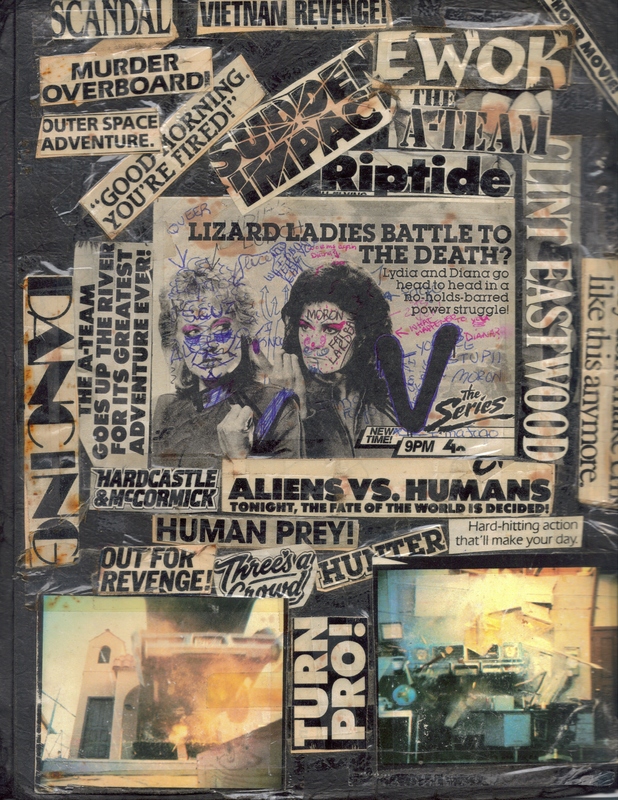 The place was hot, we were always thirsty, our hair and skin always felt like it had a sheen of oil on it, and worst of all—we all reeked like fried onions. I’m sorry, I didn’t see that as a “healthy” alternative to regular heating oil. It was absolutely disgusting. This bag was also an Old Navy choice; I bought it in the late summer of 2005 (I also bought an orange one just like it, as I recall) so that I’d have a bag that would fit my camera, maps and money. 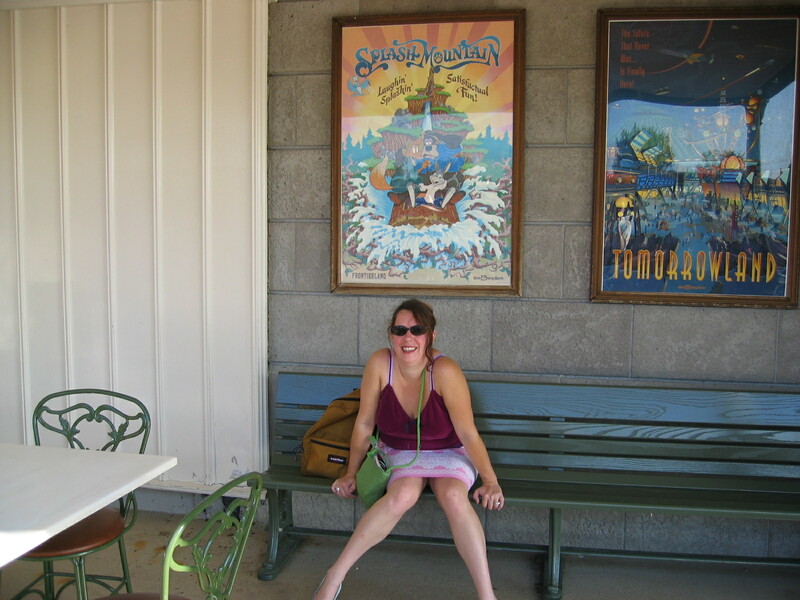 That’s me, September, 2005, in the tunnel under the Railroad Station that empties into Main Street USA at the Magic Kingdom in Disney World. 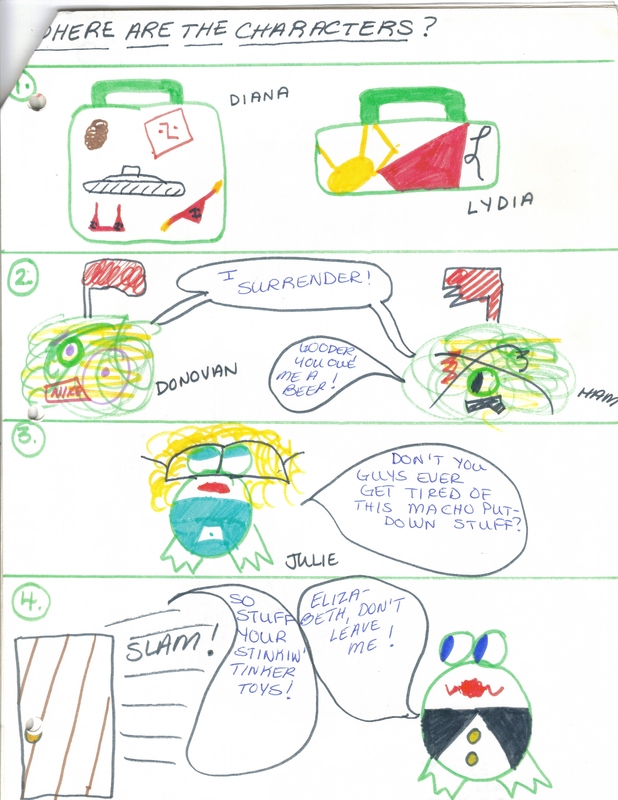 That was the first time I used the green bag. What else is significant about this photo? I ended up buying the Splash Mountain full-sized attraction poster at my Dad’s request—he was redoing his bathroom at the time and wanted something to “cheer the room up” (um, it was still avocado green and the over-the-sink cabinets and wood accents were still dark dark walnut, so I really didn’t see much difference when it was done). After he died, I got to keep the poster (the frame broke, which is fine with me since it was—you guessed it—dark, dark walnut! YAR!). The poster is rolled and carefully stored and will grace a wall in my new home in Florida—once I get a really cool appropriate frame for it, that is! 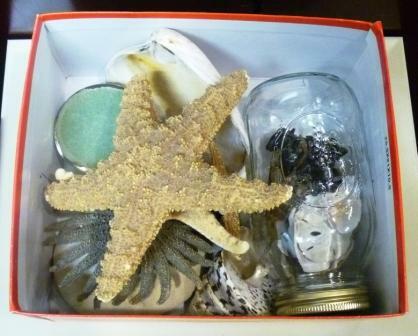 The box in which I kept my shell collection. Okay, I’ll admit my shell collection wasn’t very impressive: that’s probably because I wasn’t out to collect them, it was more like every once in awhile I’d come across something cool on a beach, someone would give me a shell as a gift, or I’d buy an interesting one as a souvenir from a sea-side vacation. But each shell (or piece of animal, as you’ll see) was also special because after I became an aquarium volunteer I was not only able to identify what which animal it belonged to pretty easily, I knew something about the animal’s biology or behavior. 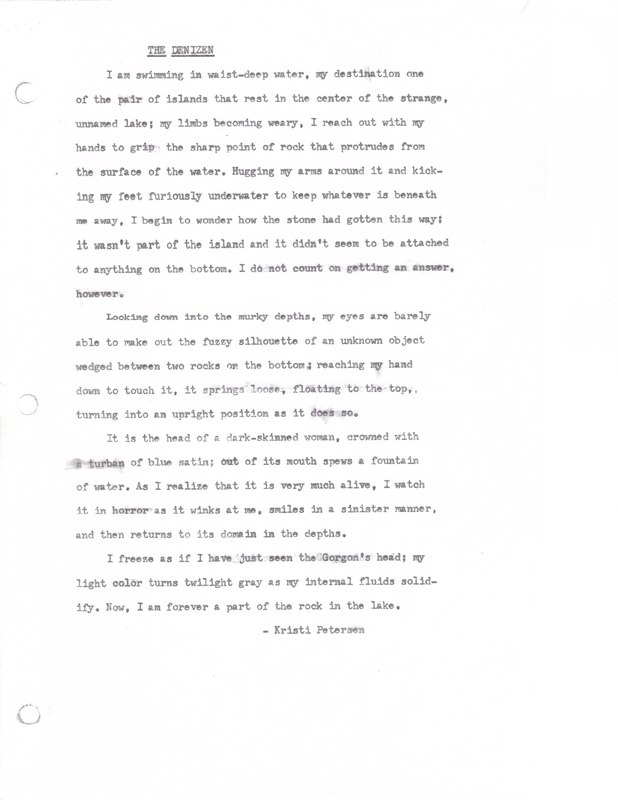 The shell collection, and my interaction with it, was a constant reminder of the excitement I felt as an aquarium volunteer—and was a constant source of inspiration for several of my short stories, among them “Jingle Shells,” “Cancer Moon” (unpublished), “Tooth and Claw” (unpublished), and “Gorlak” (unpublished). 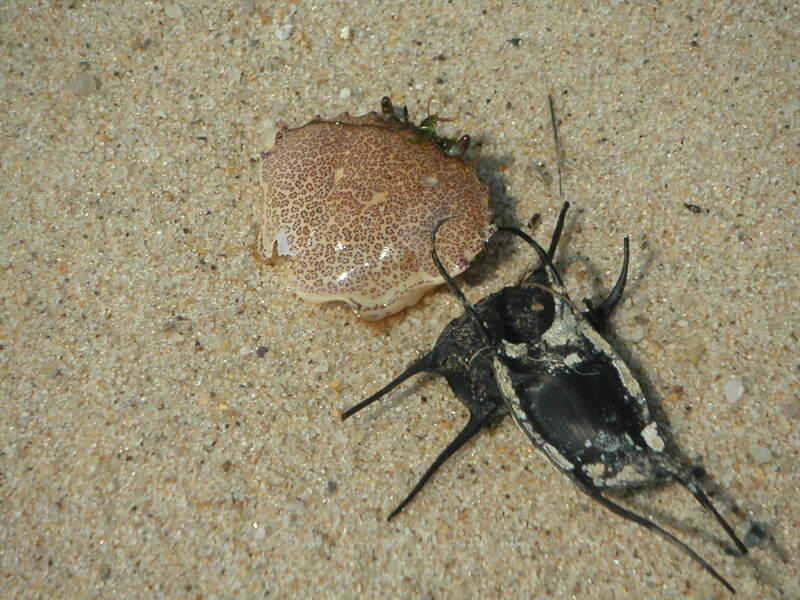 The fascination with shells began, oddly enough, nowhere near a beach. It began in my parents’ dining room way back in the 1970s, when I discovered a dried sea star (back then, I thought “starfish”) they had sitting on their hutch. The dining room was like everything else in my parents’ house—dark. Growing up in that house was like growing up in a cave. It was dark, it was damp, it was always getting hit by lightning and the bottom floor was always so cold in the winter you could see your breath (oh, and did I mention that we had to spend a lot of time thawing out the frozen pipes using a hairdryer?). If you think I’m exaggerating, feel free to ask my three siblings and they’ll tell you the same thing. 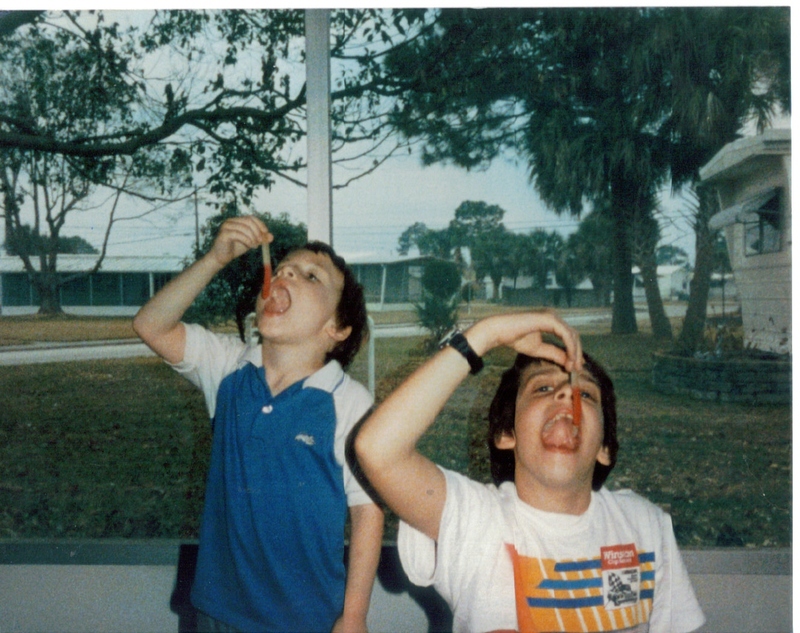 It was probably why, once I’d had my first taste of bright, sunny Florida, I never wanted to come back. As children, none of us was allowed near the hutch. It was full of my parents’ most sentimental, fragile stuff—their wedding cake topper and engraved cake knife set, plates from various states, the crystal wine glasses, the punch bowl, the serving platters, the china, Dad’s childhood poached egg cup—and a nesting doll from the Frisian Islands (Föhr), where my Dad’s father’s family is from. It was that nesting doll that grabbed my attention, and why I was near the hutch one afternoon when I shouldn’t have been. 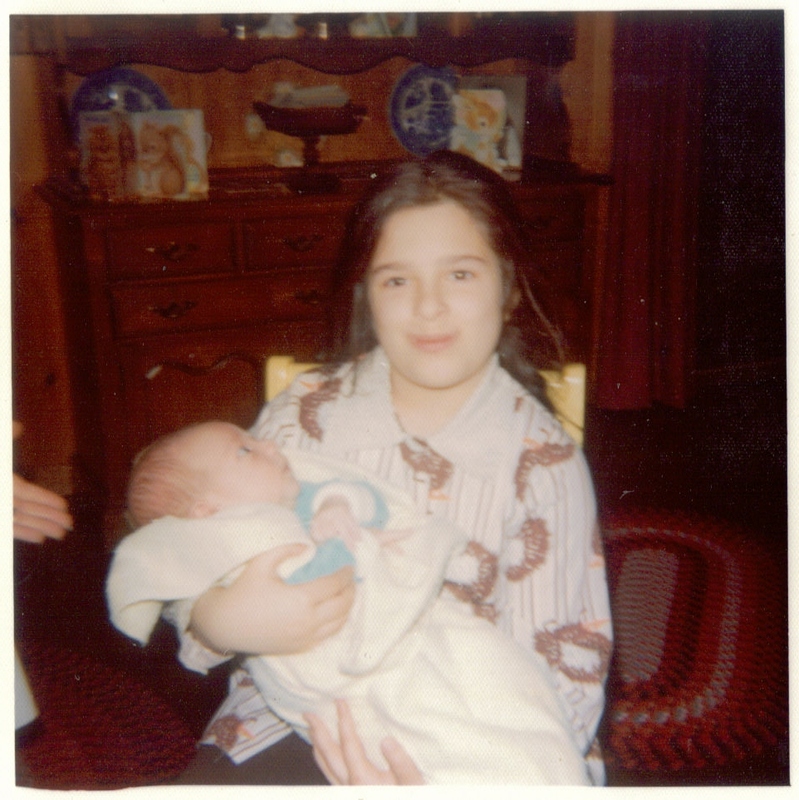 Above, my cousin Maryanne holds my brother Chuck, 1974. 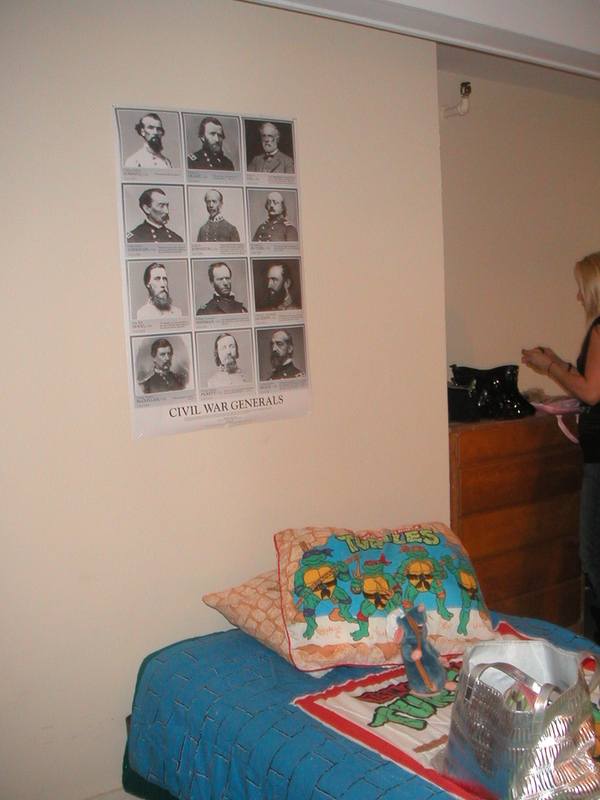 Look in the background—that’s the hutch. The sea star, which isn’t visible in the picture, was on the first shelf. Some of you might recognize it, because now the hideous thing is in my dining room. This made me excited. “Like, down at the beach?” (I was referring to our community’s beach on Candlewood Lake). After that, the Forbes’ Common Sea Star (I wouldn’t learn that’s what it was called until many years later, after I started aquarium volunteering) became a symbol of hope. Every time I thought I’m never going to get out of this hole I’d go to the hutch, pick it up in my hands, run my fingers along the creature’s prickly tube feet, and count the days until our next trip to Florida. Sometime during my adult years, while I was no longer living at my Dad’s, the Star disappeared. 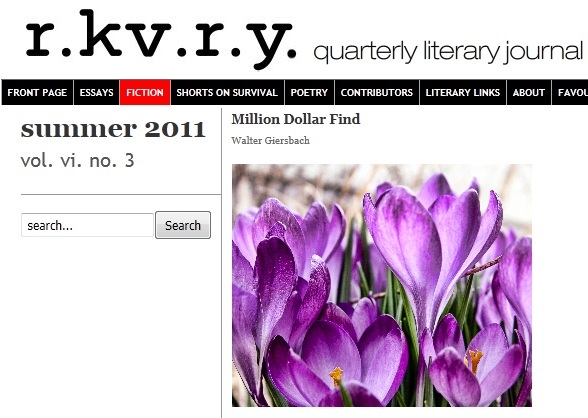 In 2008, my father passed away, and I was thrilled to re-discover it. 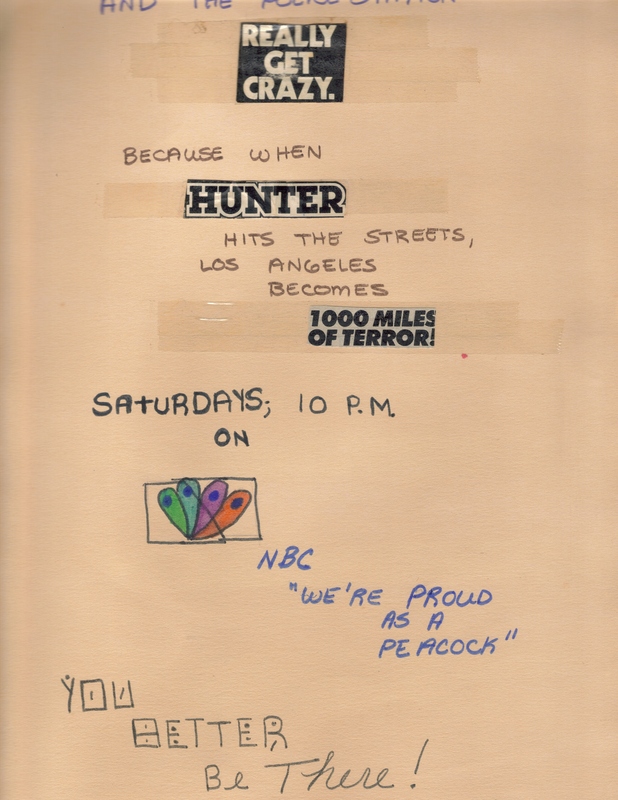 It hadn’t gone far from the hutch—it was just inside it. 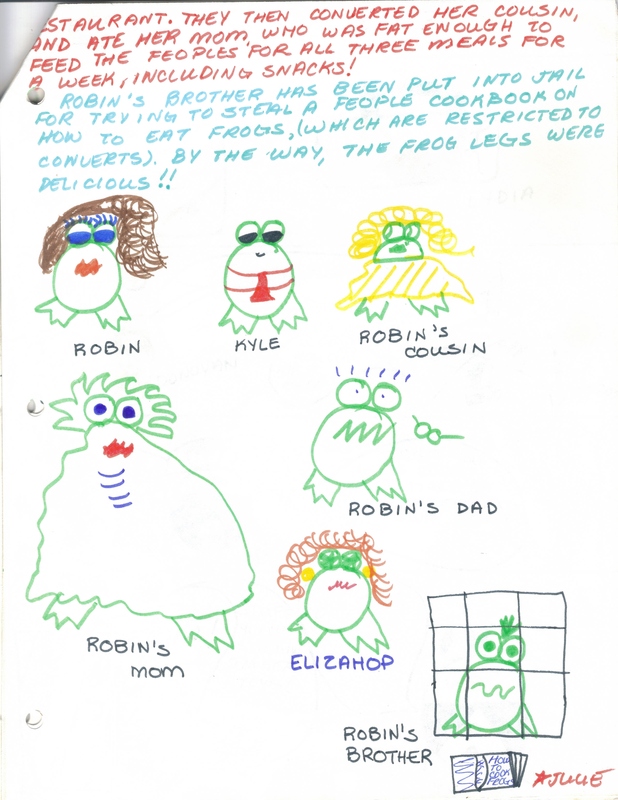 It had been shoved into a drawer with a menagerie of items that didn’t go together, such as photos, placemats, and remotes for televisions we no longer owned. 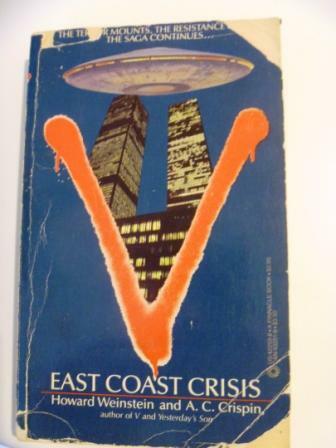 It also wasn’t in bad condition—only the end of one arm, where the creature’s “eyes” would be, had a small chip in it. I decided to keep it, and took it home. The Forbes’ Common Sea Star (Asterias forbesi) that was my symbol of hope. 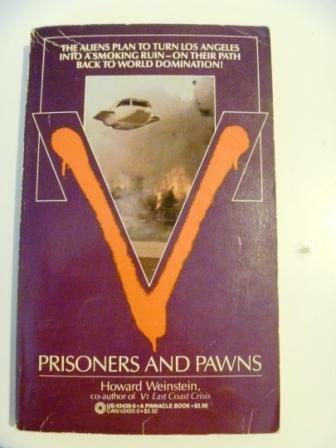 I am not getting rid of this; instead, I packed it in bubble wrap and placed it in my childhood keepsake box. 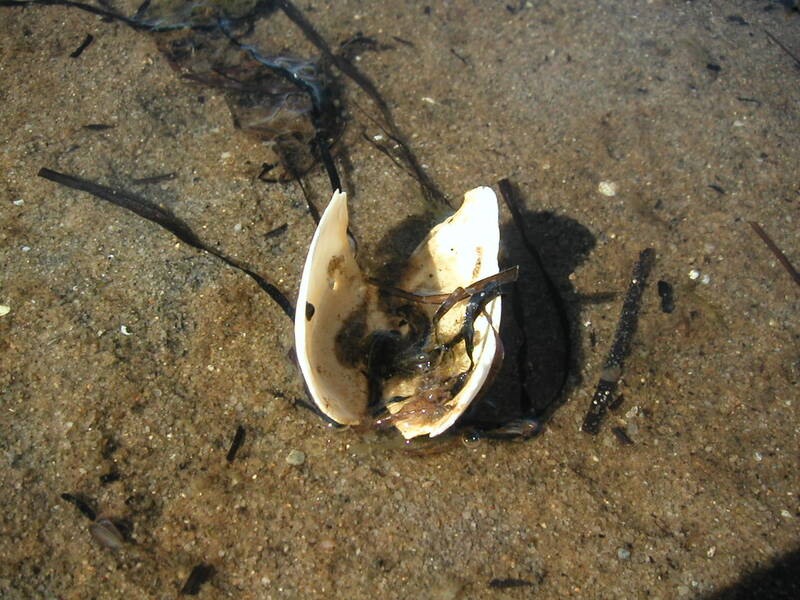 I’m very thankful it survived and I’m grateful to have it—and when I rediscovered it, I automatically had some new memories attached to it, like how many kids I’d freak out at the Touch Tank when I’d tell them the story of how a sea star eats: by inverting its stomach into the body of the prey. That sea star was one of the many items or experiences that contributed to my fascination with the sea and my eventual role as an aquarium volunteer, but my love for it would eventually lead to collecting all kinds of other stuff that, sadly, I just can’t keep. Here’s a little tour of my aquarium adventures and the shells that I am letting go. 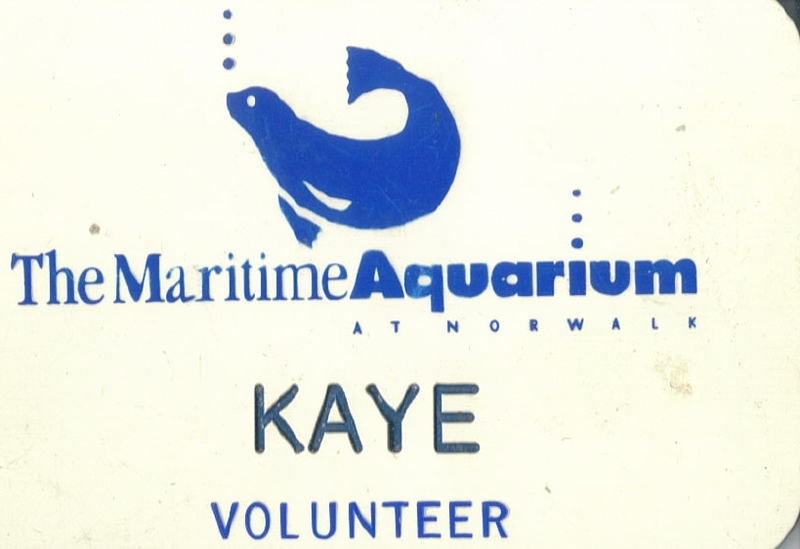 My Maritime Aquarium volunteer badge. 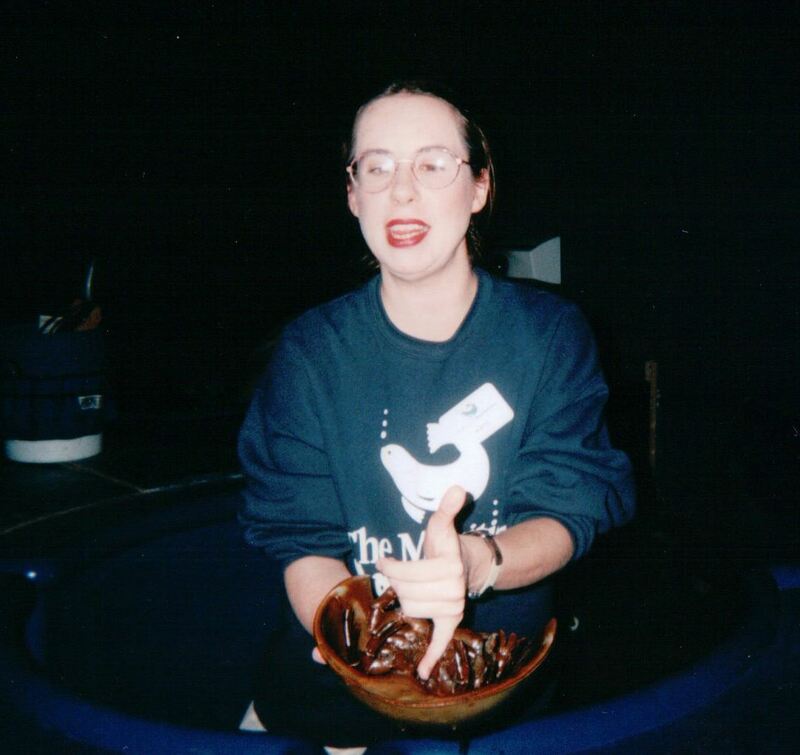 I started working at the aquarium in late June, 2001; in my tenure there, I logged 1,319 hours. Very often, I’d work all day long both Saturdays and Sundays. I just loved it. 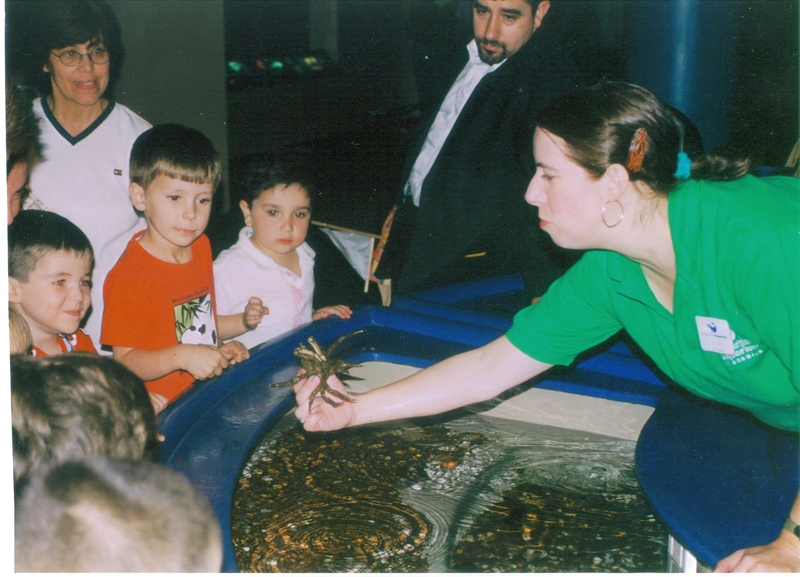 That’s me working the Maritime Aquarium at Norwalk’s Touch Tank, summer, 2001. 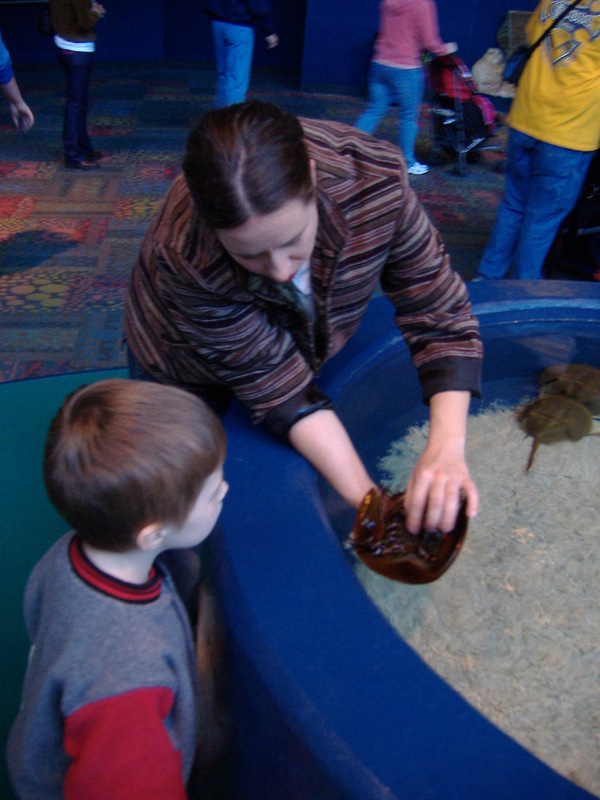 There were several stations where we could work, but the Touch Tank was my favorite. Here, I was making the spider crab (Libinia emarginata) “sleep” by turning it on its back so the kids wouldn’t be afraid to touch it—actually, it’s not really anything like sleep at all. It’s a defensive pose to ward off predators.. A little-known fact? I was actually TERRIFIED of working the Touch Tank when I first went to work there, BECAUSE of the crabs. 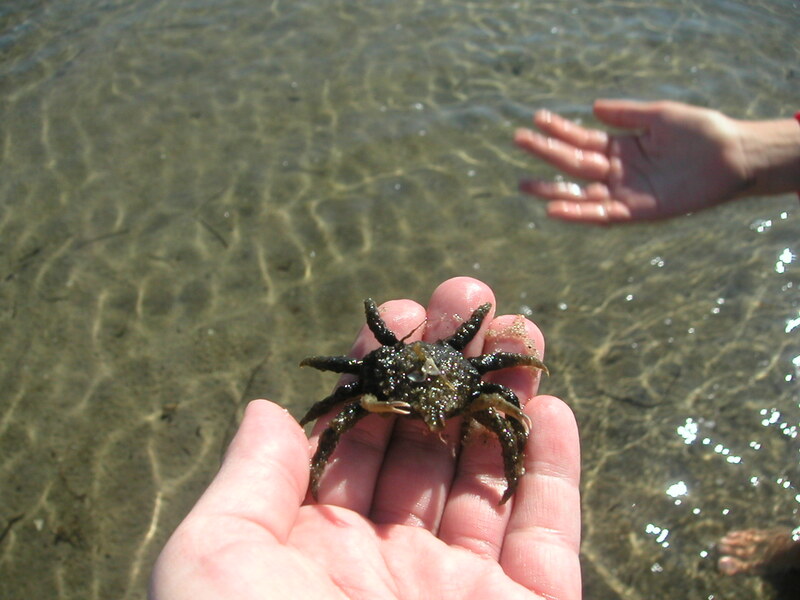 True story: I’ve anxious-ambivalently romanced crabs since I was five, when my father had carried me to a Long Island Sound sandbar, set me down, and made his way back to the mainland. “You can do it, Kristi!” he’d called. 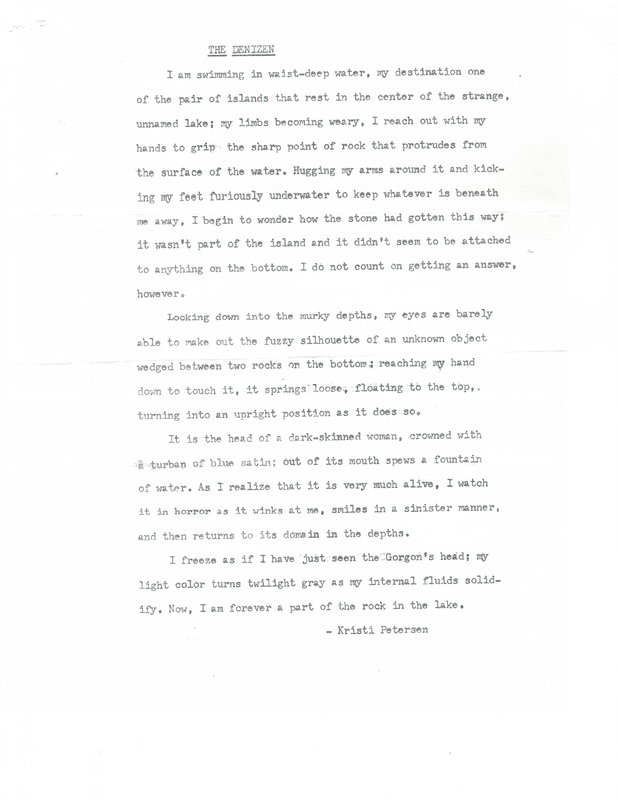 “Walk to me!” Between us, a submerged field littered with half-buried—but very much in motion—crab claws; I imagined, attached to each indigo, white, bright orange pincer, a salivating beast. 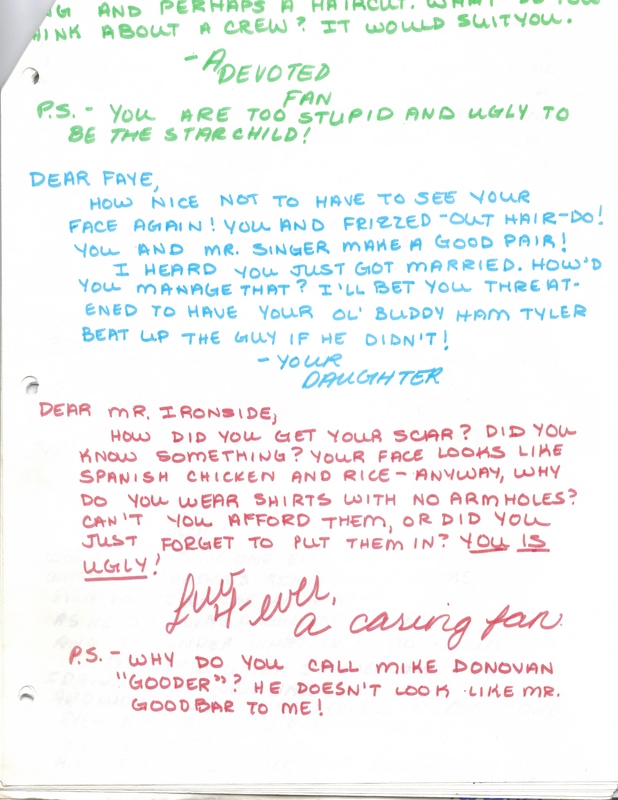 Whimpering like a seagull, I’d squinched my eyes closed and walked toward my father’s beckoning gestures. I made it pinch-free, but the experience scarred me, and I possessed a fear of crabs that wasn’t cured until I started working the Touch Tank. April 5, 2002—I was working an overnight (a camp-type deal in which the kids sleep over at the aquarium) at the Maritime Aquarium at Norwalk. Here, I’m talking all about the horseshoe crab (Limulus polyphemus). My favorite stories to tell about this crab involved its instinct (and terrifying) Silurian, Cambrian and Devonian ancestor Pterygotus, which could grow up to nine feet. 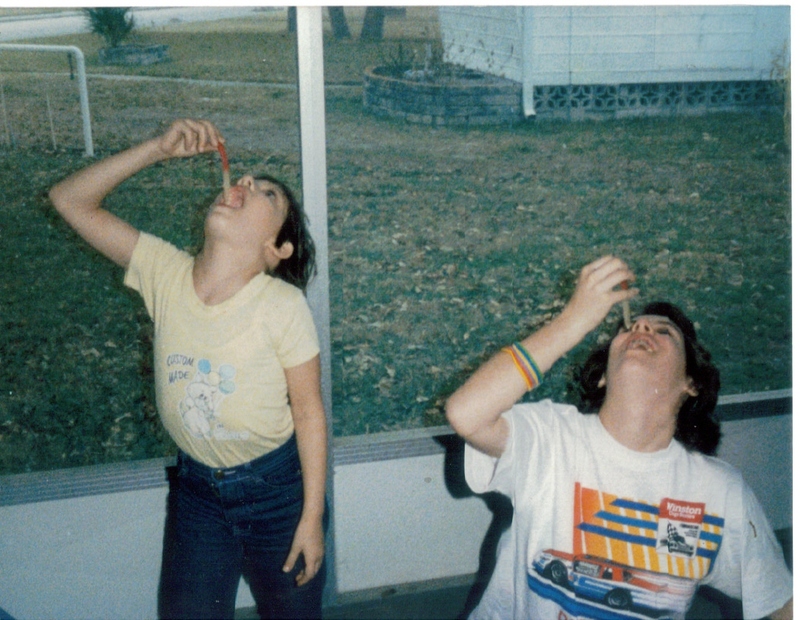 I had a photo I used to show the kids. If you want to know what Pterygotus looked like and get a sense of its size, here’s a pretty good model: http://bugguide.net/node/view/505441/bgpage. 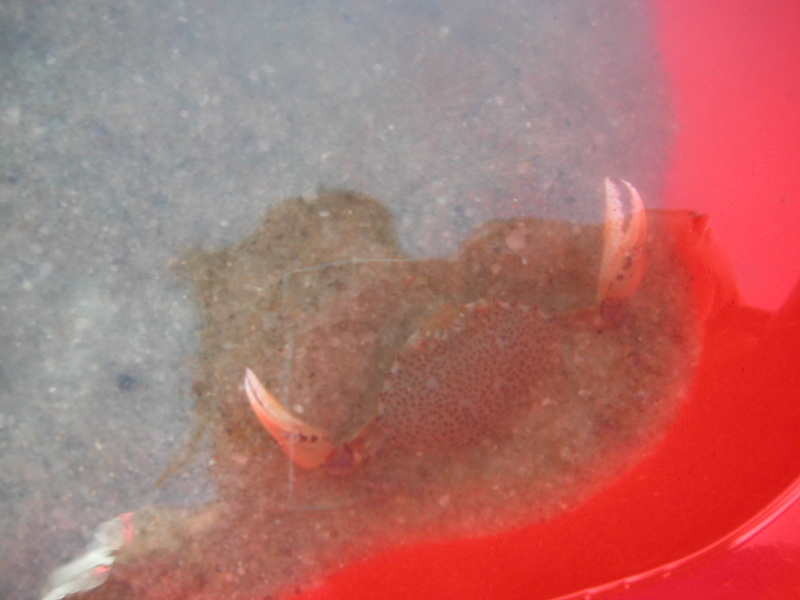 I also liked to show the kids how the horseshoe crab uses its spike-esque tail to flip itself over, and got a huge thrill out of allowing the kids to stick their fingers into the crab’s chelicerae (pincers near the mouth) so they could feel that there was only pressure and not a pinch. Part of being an aquarium volunteer at Maritime involved working outside events. 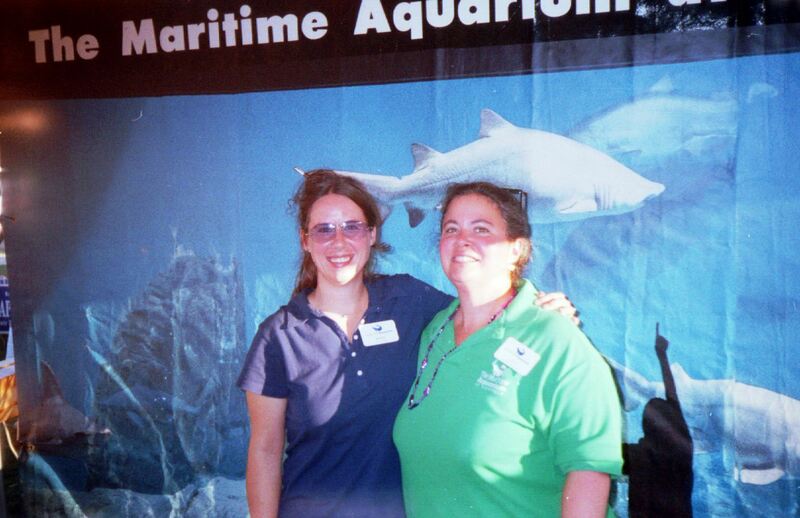 Above, me and fellow volunteer Judy work the aquarium’s booth at Norwalk’s annual Oyster Festival, September 7, 2002. 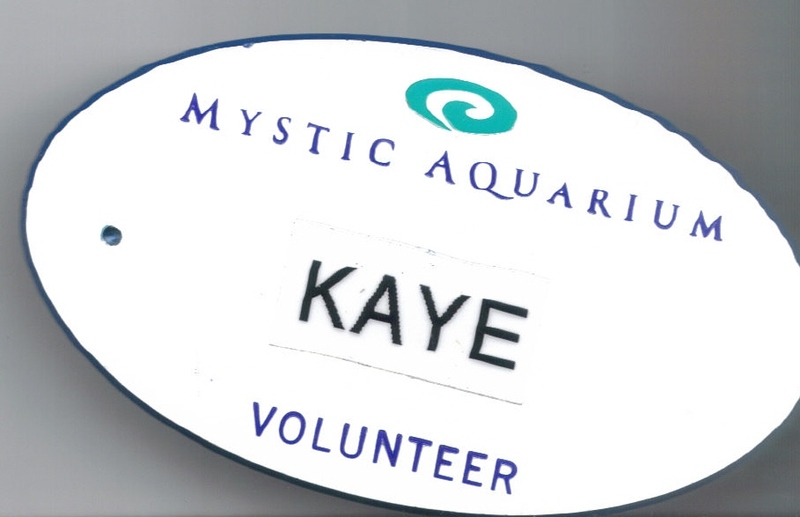 In March, 2002, I signed on as a Fishes & Inverts volunteer at Mystic Aquarium & Institute for Exploration in Mystic, Connecticut. I never wore this badge—no one in our department wore badges—because the work was hands on, you crawled around a lot, you were up on ladders over tanks, et cetera. There was just too much danger of it falling off, or getting snagged on something. I logged 207 volunteer hours during my tenure at Mystic. I was also a member. This is one of the stickers that never quite made it to my car. In January 2009, I visited the National Aquarium, Baltimore. 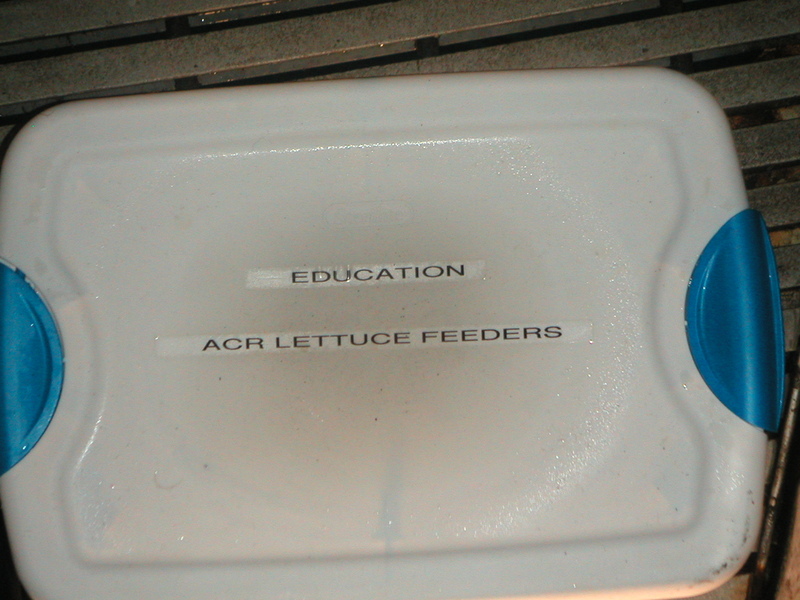 Set near one of the tanks was the above container—a familiar sight for me, since this was exactly the same system we’d use for storage and distribution of feeds at Mystic Aquarium, even though this clearly belonged to the Education department and not to whatever their F&I department equivalent is. Lettuce is a common feed, by the way—even the fish need vitamins and roughage! Of course, visiting aquariums is as much fun as working at them! 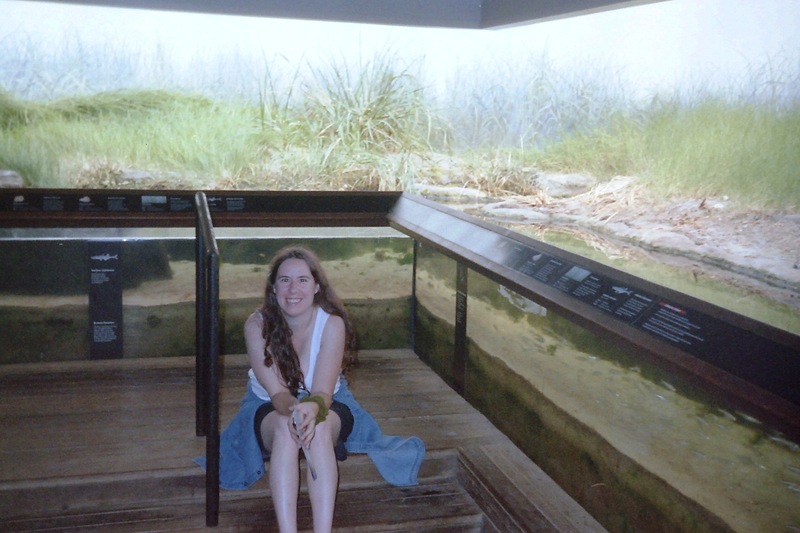 Here’s me in the salt marsh exhibit at the New York Aquarium on Coney Island, June 21, 2002. 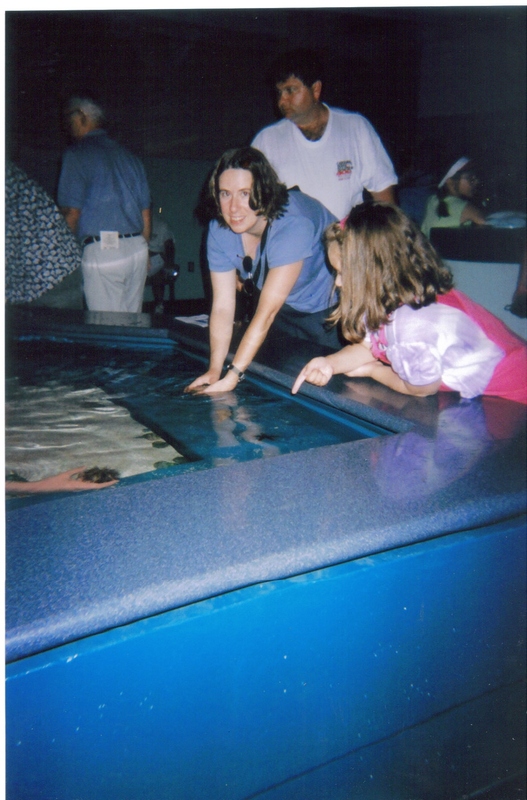 Me at the North Carolina Aquarium at Roanoke Island’s Touch Tank, June, 2003. The girl in pink is my niece, Andi. 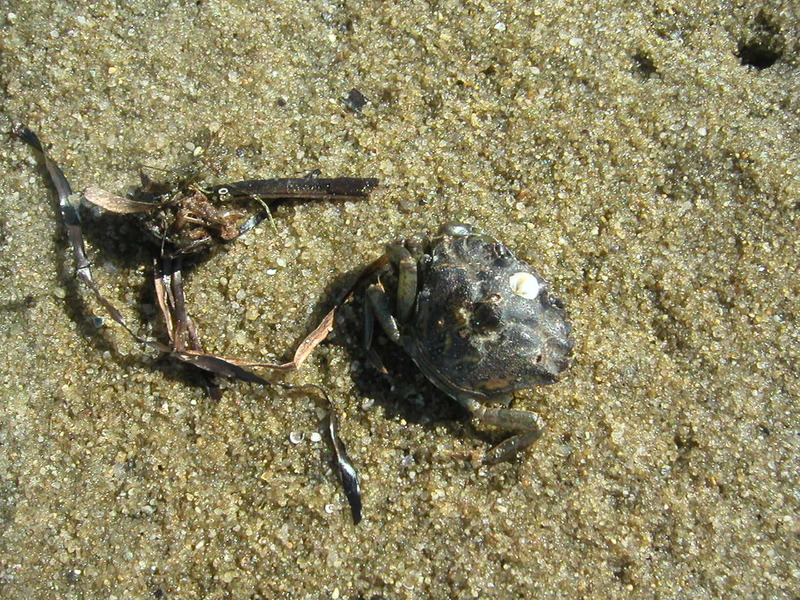 A Ghost Crab (Ocypode quadrata), caught on the beach at Duck, North Carolina (in the Outer Banks), June, 2003. I only kept him for a half hour or so. 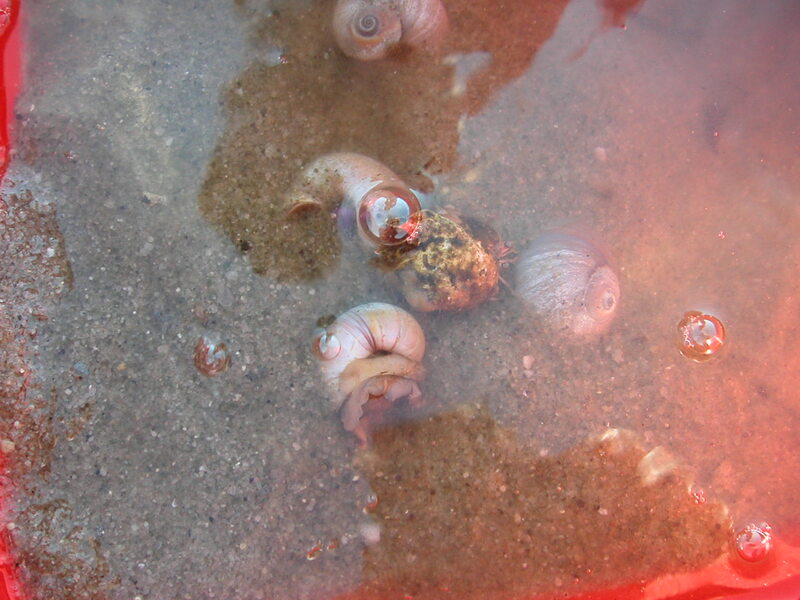 He was safely returned to the beach with his buddies. Ghost crabs were always a favorite of mine, and they figure prominently in more than just one scene in an unpublished novelette of mine called Gorlak, which I wrote back in the early 2000s. For fun, I’ve put one scene in which the crabs are prominent here. I’ll just give you this caveat: this has the potential to be a great scene to move the story forward in terms of both escalating danger (plot) and clarifying the issues between Petra and Simon, but in its current state it feels like it’s an outline. 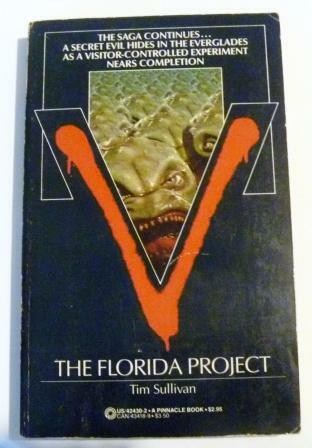 I’ll definitely be reworking this entire book when I get to Florida. Still…enjoy! 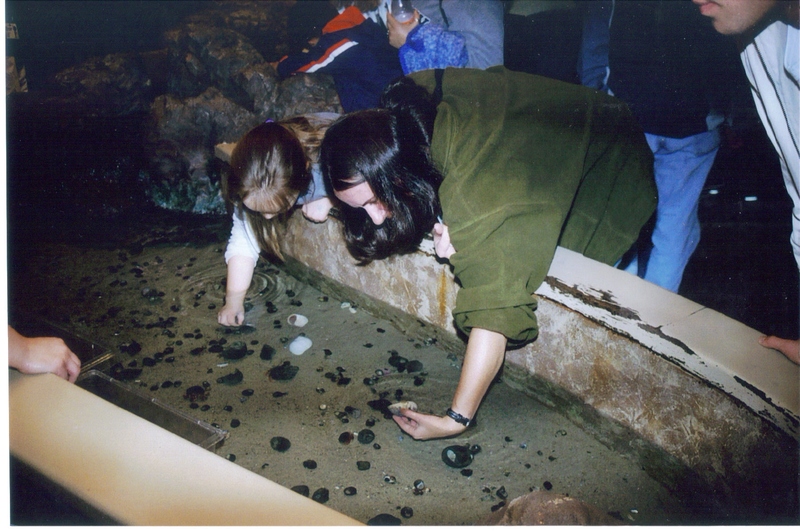 It looks like I’m examining a mussel at the New England Aquarium (Boston)’s Touch Tank in October, 2004. 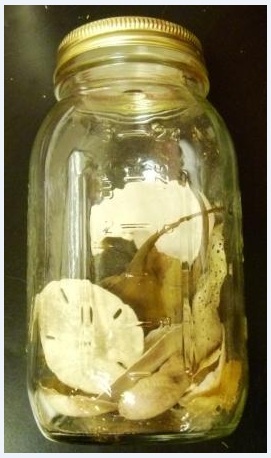 Remember when I talked about my favorite things to do with horseshoe crabs? Here, I’m showing Nathan’s nephew Jakob that there’s no pinch—only pressure—to the crab’s chelicerae. This photo was taken at Ripley’s Aquarium of Myrtle Beach, South Carolina, April, 2006. I know, isn’t this awful? There isn’t just an adult in here, but a baby hooked around the adult’s tail, so look closely. I am not sure what species of seahorse this is—I’d say Potbelly (Hippocampus abdominalis—the most common varieties you will see in aquariums are abdominalis and H. erectus), but not only are the skin markings inconsistent, the shape is a little too classic, especially since baby Potbellies tend to be extremely slim in the middle. If I had to guess, I’d say a Zebrasnout, because although you can’t see it in the picture, if I look at the object itself very closely, the animal appears to have markings consistent with that species. 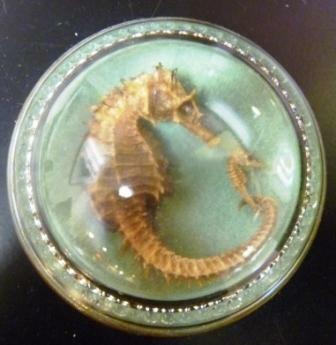 I have no idea how old this paperweight is; my housemate picked it up for me at a tag sale. I am actually NOT getting rid of this—I’m keeping it. Just because it’s the only seahorse-related object I own, and on my first day volunteering at Mystic, they asked me to water change a behind-the-scenes seahorse tank. It was my first time getting a siphon going, and I ended up with a mouthful of seawater. One of the most interesting things about seahorses—besides that the males give birth—is that they have no stomachs. 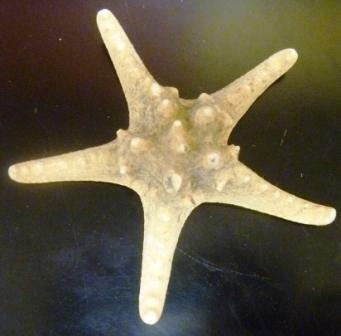 This is a Sunflower Star (Pycnopodia helianthoides), which you’ll mostly find from Alaska down to Southern California. I bought this at the North Carolina Aquarium at Roanoke in 2003. 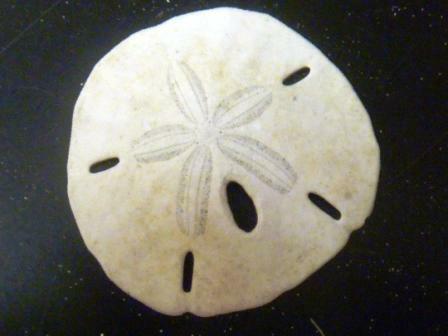 This is the endoskeleton of a Brown Sea Biscuit (Clypeaster rosaceus). 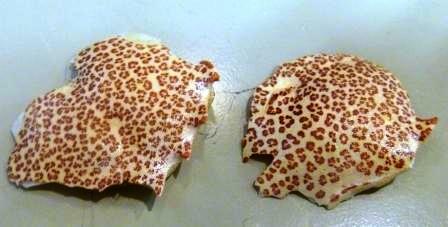 Sea biscuits are echinoderms, just like sea stars and sea urchins. They are indigenous to the southern North American coast: from North Carolina to Florida, the Bahamas, the West Indies. 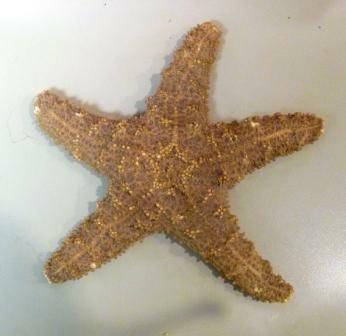 This is a variety of “knobby” sea stars, such as the Chocolate Chip Sea Star (Protoreaster nodosus). 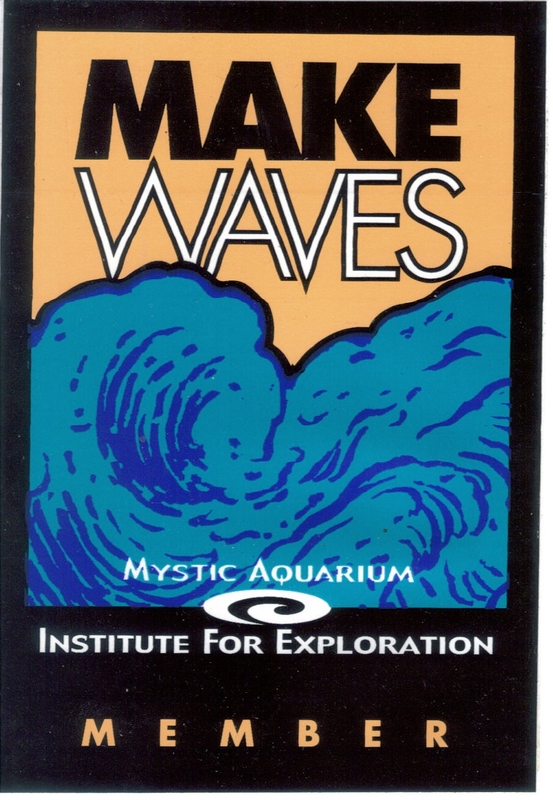 I remember being thrilled to find this in the North Carolina Aquarium at Roanoke gift shop in 2003. 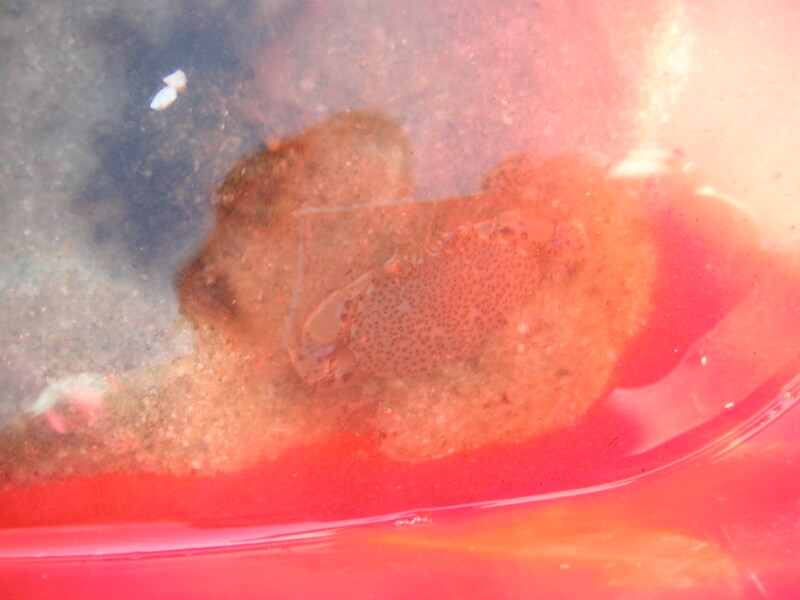 I swear, I really DID take a photo of a Chocolate Chip Sea Star in a tank, and I’ve been through all my files and can’t find it. So, I’ll give you a picture of another pretty sea star. 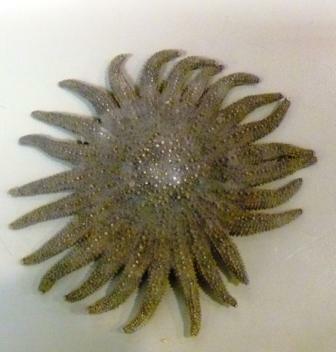 This one is, I think, a Cushion Star (Oreaster reticulates). The reason I’m leaning toward Cushion Star is because of the way the knobs on its exoskeleton are not only equidistant, they form a “network” of squares and that’s a dead giveaway for that species. This was taken at Epcot’s The Seas with Nemo & Friends (formerly The Living Seas) Pavilion in Orlando, Florida, in September, 2006. Clams are, in all fairness, not my forte. So many species are so close to each other in shape that for me it’s tough to sort them out. 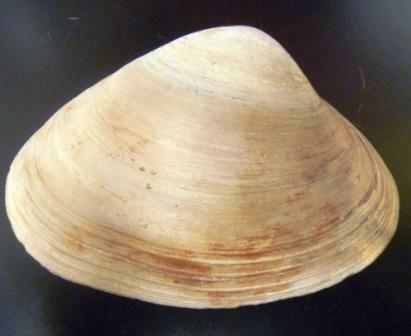 I’d say this is a Northern Quahog, but the “notch” at the top doesn’t lean the right way, so it could just be a good old Surf Clam. I’m totally guessing, so if anyone knows for sure, please give a shout out. The glass jar in which I kept the smaller, smellier shells and pieces of animals (God, I opened this, the stink was out of control, even for me, who has no problem with dead fish/animal smells). 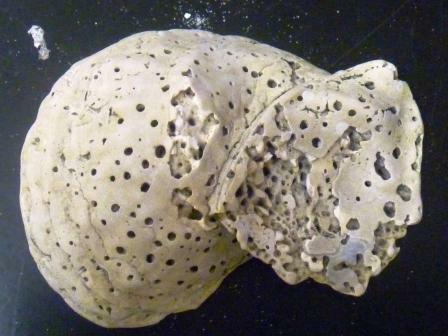 While this endoskeleton is commonly referred to as a “Sand Dollar,” it isn’t. 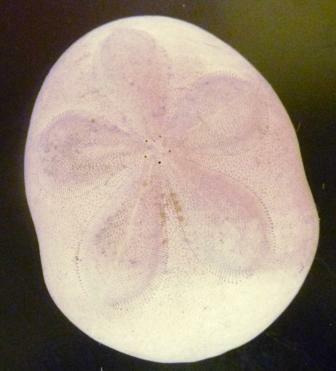 Technically, it is a Keyhole Urchin (Mellita quinquiesperforata), although in fairness, it’s more closely related to sand dollars than to urchins. How can you tell if you’re buying one at a shop? Look for the single large “keyhole” toward the middle (if it’s an adult). If you’re looking at a box of really small ones, chances are they weren’t adults yet, and the “keyhole” shape might be filled in. 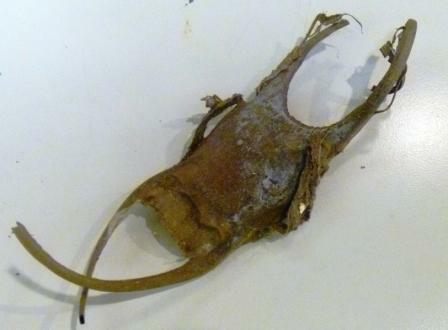 This is an egg case for a skate—sometimes referred to as a “Mermaid’s Purse.” While skate cases are basically of similar shape, they can be different, depending upon the species. The one pictured here is a Winter Skate (Raja ocellata ) egg case—notice its “olive” coloring and the very long, curled tendrils on either end. You’ll find these commonly washed up on the beaches of New England, but I know for a fact I got this one from Mystic Aquarium because we had that species there at one time. 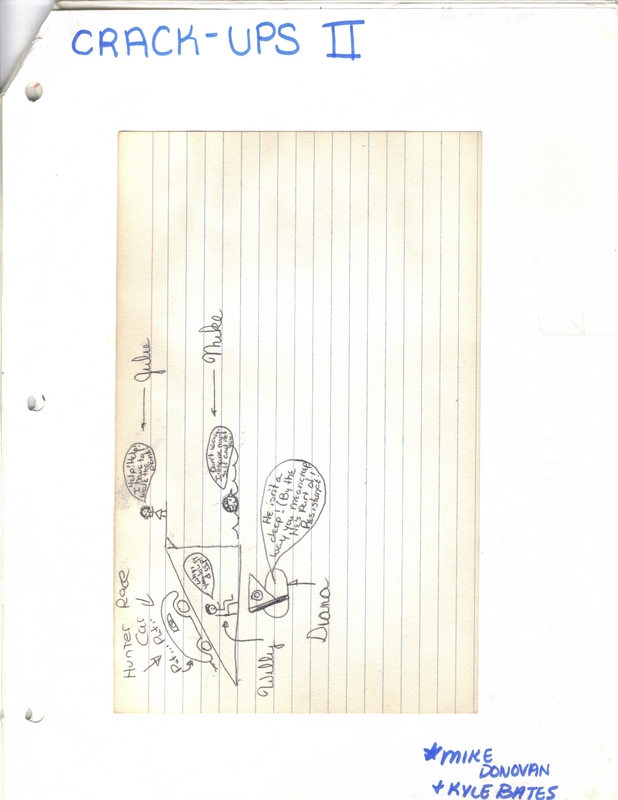 At Norwalk, on the other hand, the types of skates we had were mostly Clearnose (Raja eglanteria). 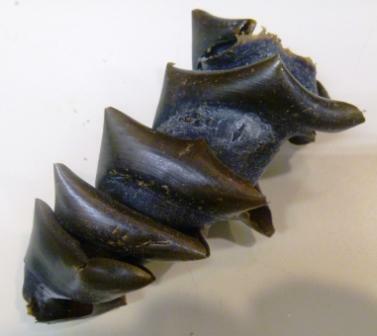 Their egg cases are more toward black in color (think Hefty garbage bags) and are more plump, and the “purse” part of it is shorter in length than the tendrils. 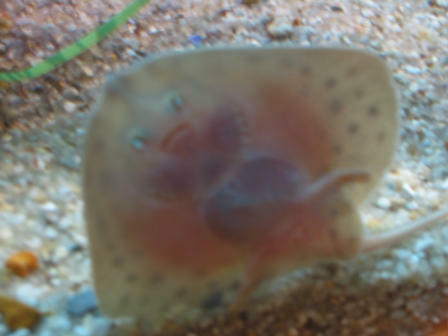 A young Clearnose Skate in the Maritime Aquarium at Norwalk’s nursery area, April 5, 2002. I have to take a break here and tell you a couple of stories about my experiences with skate cases. It seemed like—particularly at Norwalk—the skates were always producing them, and most of the time they were empty: nothing in them, so they’d float. On one occasion, I was working an after-hours wedding reception at Maritime Aquarium at Norwalk, and the cocktail hour was set up in the Long Island Sound gallery on the second floor near the Touch Tank. The bride came to me, very distraught. She said it looked like the fish in this one tank were dying. I left the Touch Tank in the hands of the other volunteer, but not before I grabbed the keys to the back-up area for that section of the building, just in case. I had already, at that time, been working for Mystic for a few weeks, so I knew more about intakes/outtakes and how the tanks and filtration systems worked than most of the other volunteers, who were only trained in facts and procedures (why I went to Mystic in the first place—I wanted hands-on experience. I wanted more doing and less talking). The bride led me to the Sandy Bottom tank—this was a tank that contained Clearnose Skates, Weakfish, Flounder. The Weakfish were listless, some of them listing to the side, a couple resting on the bottom. The gills were still pulsing. That was when I noticed the water had a “soupy” quality to it—it looked thick, almost like how heat waves look coming up off asphalt if it were air we were dealing with. I knew that had something to do with the water not being aerated properly. I had to admit I was panicked then, but I told the bride it wasn’t a problem and thanked her for alerting me. Then I took the keys, went into the back up area, climbed the wooden stairs that lead to the top of the Sandy Bottom tank, and was relieved to discover that the source of the issue was right in front of me: without getting too complicated, I’ll just tell you that everything was jammed up behind a bunch of empty skate eggs. I got a net, I removed them, and by the time I left the aquarium a few hours later, the “soupy” water had thinned out quite a bit and the fish looked like they were beginning to recover. 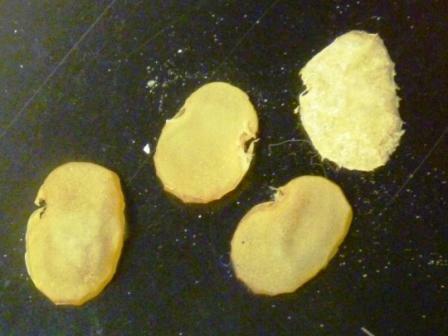 That was one problem with empty egg cases. 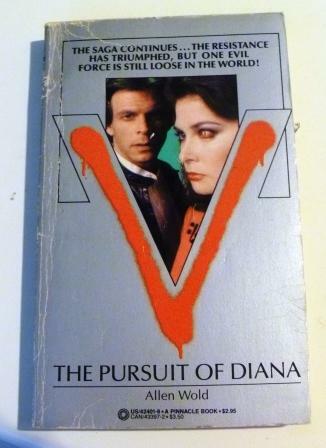 Occasionally, you did find a full one. 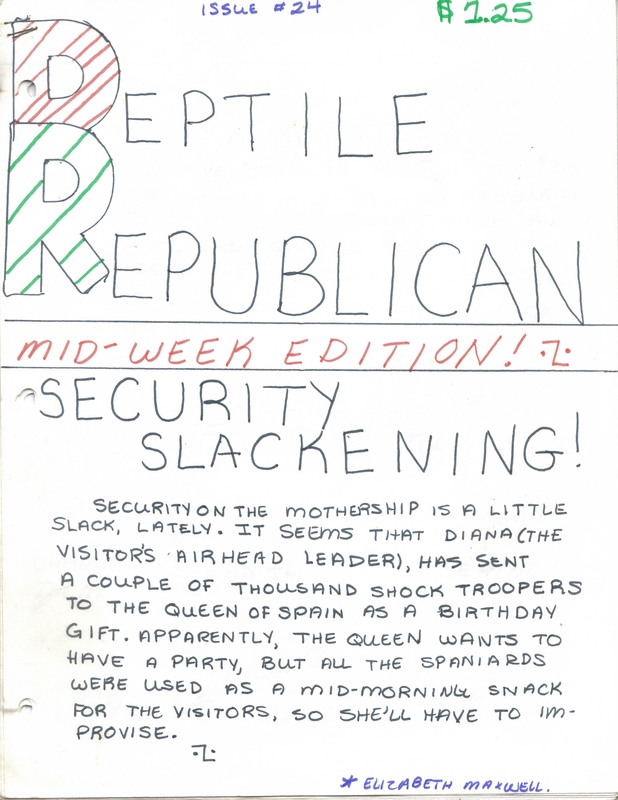 Below in PDF, a section of my journals from that year entitled “Embryonic Mess,” dated April 14, 2002. Enjoy! At Mystic Aquarium, it was the Horn Sharks (Heterodontus francisi, I THINK) in tank T-13 (don’t hold me to that, I’m pretty SURE it was T-13, but it’s been eight years now) that were always laying eggs. Above, one I removed from the tank and kept—I pulled about fourteen out of there on that day, more than enough to go around to the education department, etc., and still keep one. Yes, it was empty! I miss those days as a volunteer, and every once in awhile it’s still possible for me to get a taste of that. Provincetown is one of those places where it’s possible. Here’s some neat discoveries I made on the beach at low tide behind Norman Mailer’s House in Provincetown, Mass, August 14, 2010. This was the view from Norman Mailer’s back porch in the morning before class started. 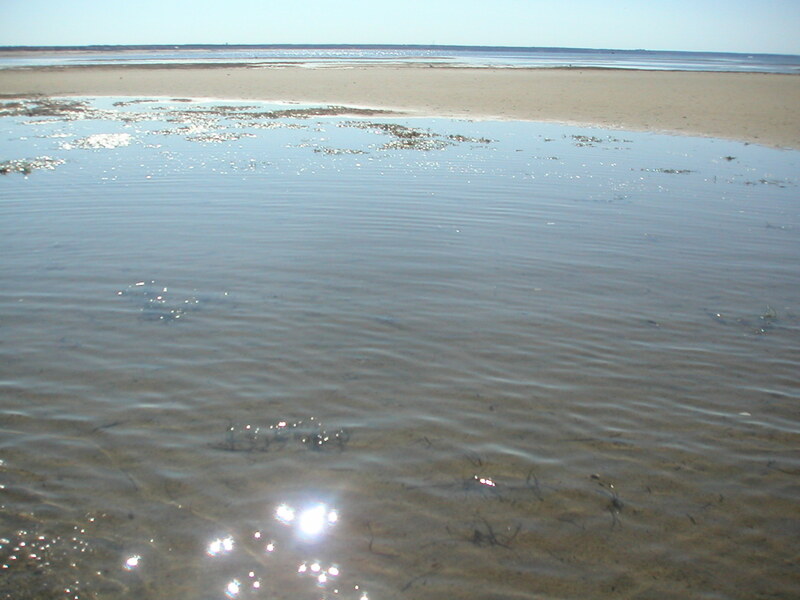 When the tide is out, it’s possible to walk almost as far as the eye can see. Boats are sitting on the sand, animals are left behind. It’s almost like walking in a Dali painting. But it’s also like walking into a glassless aquarium. On my walk, I ran into some children, and it gave me the opportunity to share some of what I knew about the animals we found—it felt like old times. 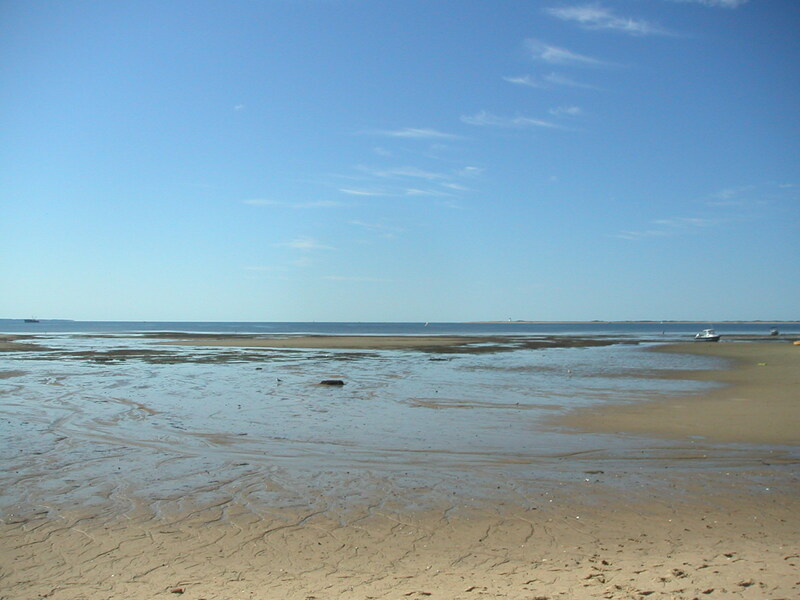 The following are all items I picked up walking at low tide in Provincetown, or on the beach in Newport, RI. I just photographed this but didn’t pick it up. It’s obviously a clam or mollusk. 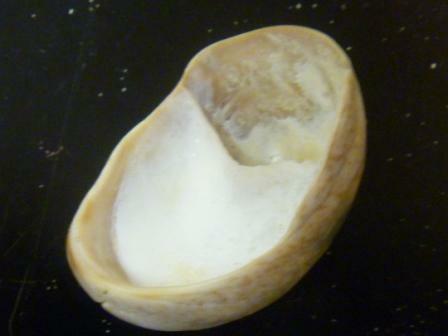 This is a Northern Moon Snail shell. There’s a Hermit Crab hiding inside. 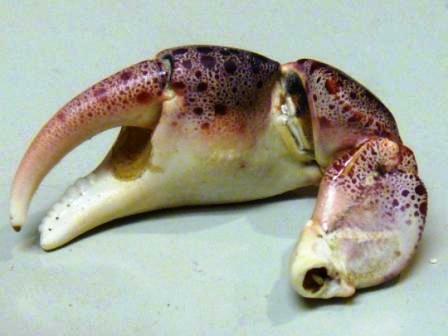 The Long-Clawed Hermit Crab (Pagurus longicarpus) in the shell of a Moon Snail. On a couple of occasions at the Maritime Aquarium, I got lucky and saw one of these run out of one shell and into another—basically, moving from one home to another. It’s hysterical—they make a mad dash, and if you blink you miss it. This is the carapace—actually, when I picked it up it turned out only to the be the “back,” so to speak—of a Lady Crab (Ovalipes ocellatus). This was not a molt; rather, it’s probably what a feasting bird left behind—when I flipped it over there were bits of the animal’s flesh stuck to the underside. 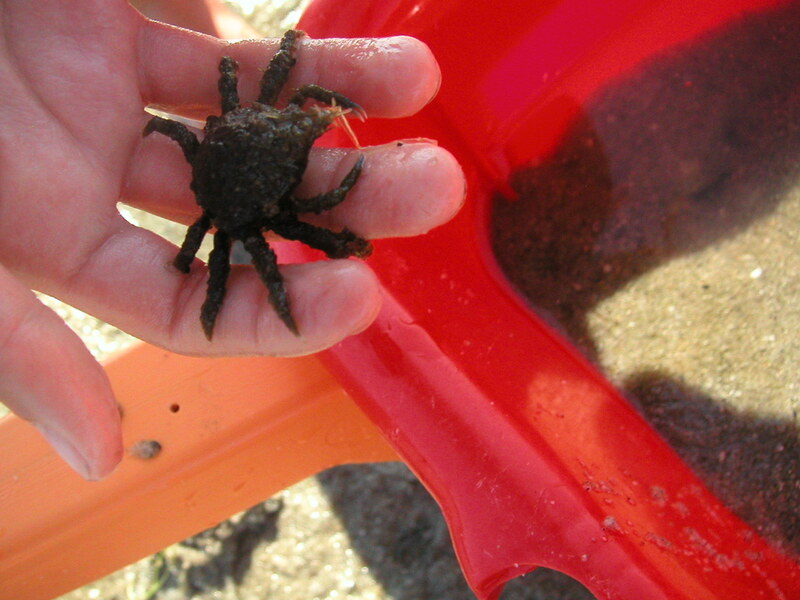 A baby Common Spider Crab (Libinia emarginata). This little male was pretty feisty, but his teeny pincers really couldn’t do very much, so I spent time making fun of him. Trust me, I’ve been pinched by adults plenty of times and it HURTS. 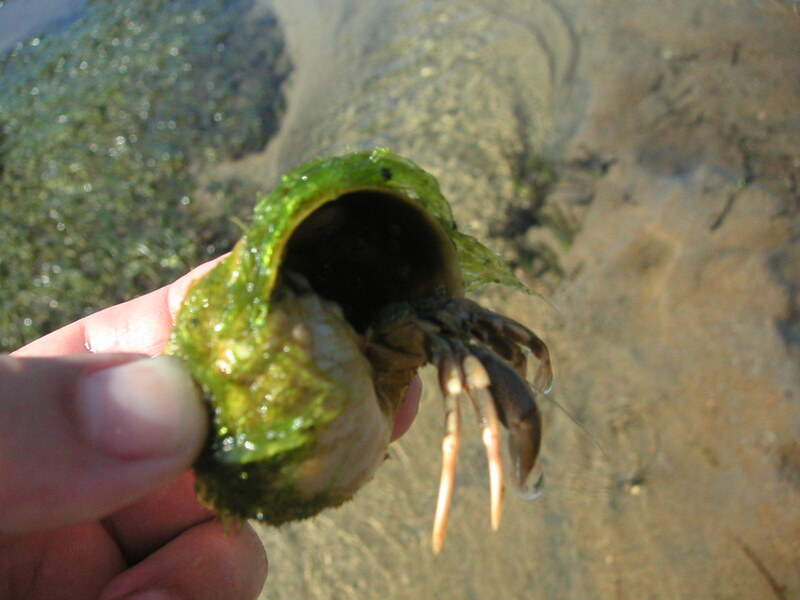 If there was any crab it took me the longest to learn how to handle effectively, it was the super-aggressive Green Crab (Carcinus maenas), a nasty-tempered invasive species that found its way over here from Europe. 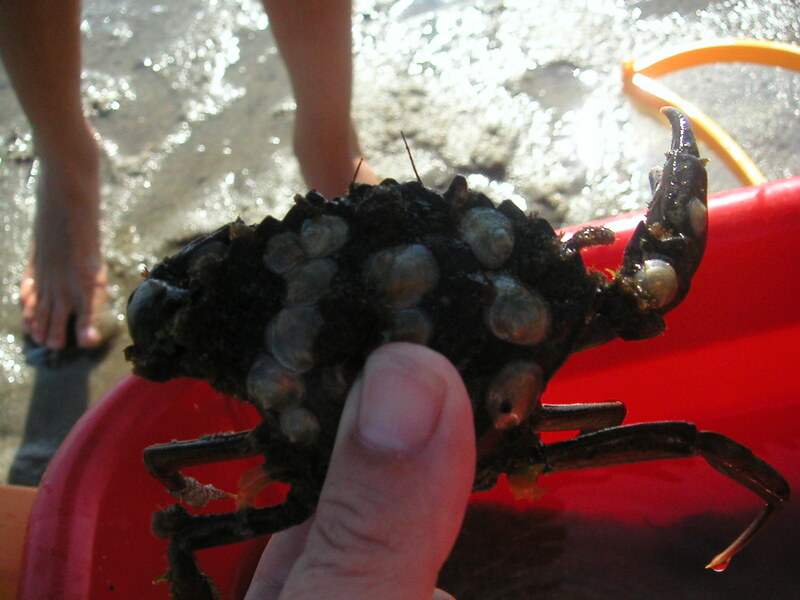 This one is covered in Jingle Shell Clams (Anomia simplex). This one is a male. Flipping him on his back like this puts him “asleep.” He won’t be pinching me this way. See how these Jingle Shell Clams sparkle! Totally cool. 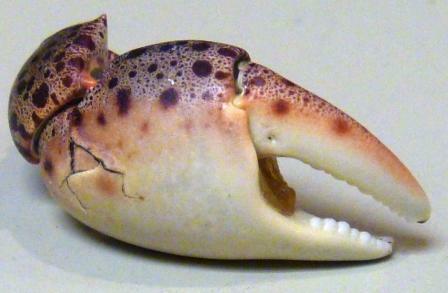 However, this crab is displaying its defensive posture. Don’t get too close. 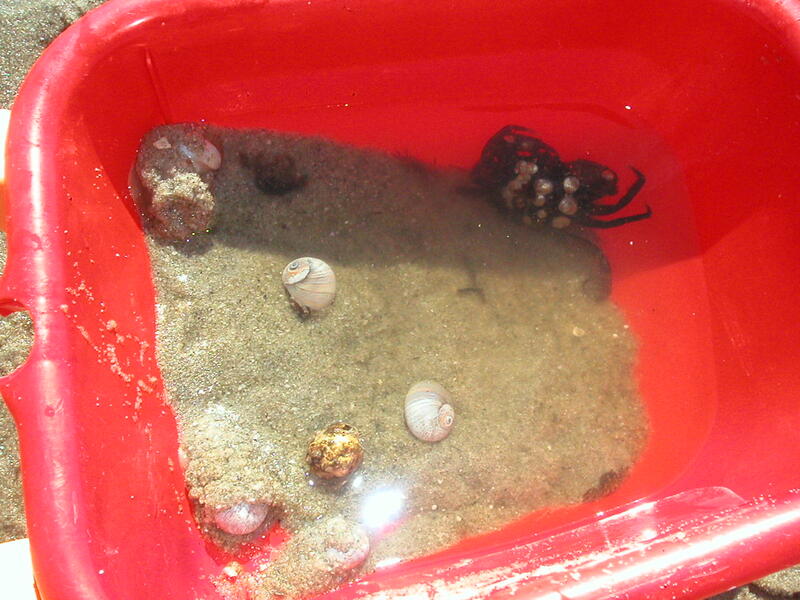 The kids I met on the beach had a red wheelbarrow in which they were keeping their live treasures (they did plan on returning them, they just wanted to “play” with them for a little while). Here in their wheelbarrow, we see the Green Crab (which I put in there for them) in the back corner and an assortment of small gastropods. 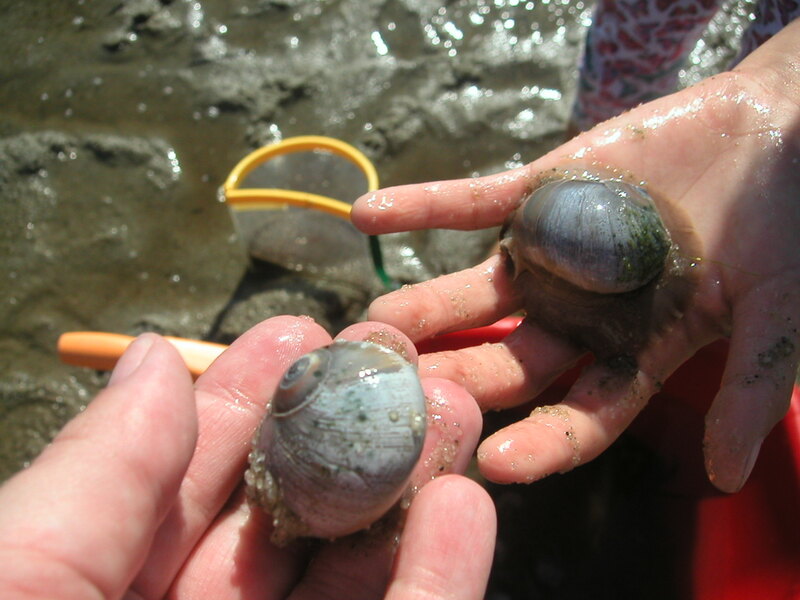 The two gastropods you can see clearly in this photo are called Shark Eye (Polinices duplicatus). 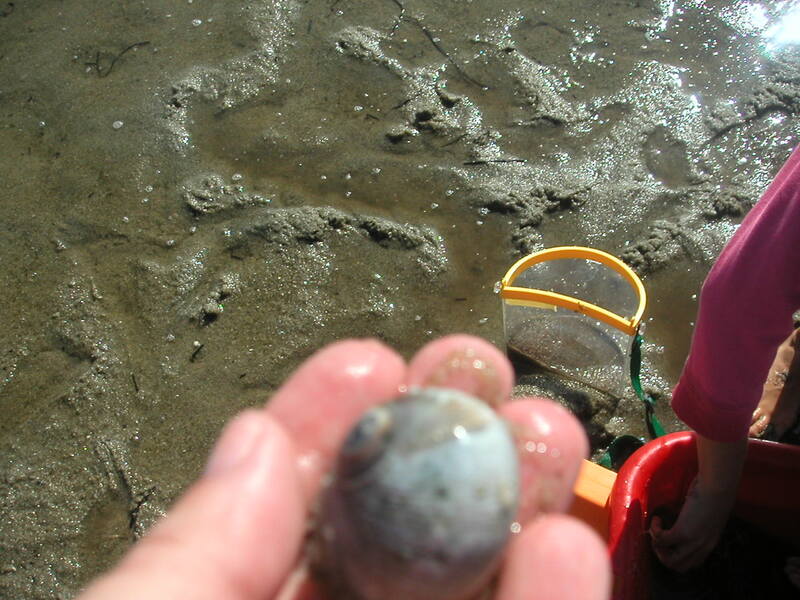 Here, we see a Hermit Crab hiding in a shell I can’t identify because of the photo (this is a different Hermit Crab than the one I was holding before; one of the kids picked it up and put it in there) and four Shark Eyes lolling about. Holding our Shark Eyes. I love picking up snails, especially on a hot day. Their “feet” feel cool on the palm of the hand. The pool in which we found most of our treasures. Here’s that little Libinia again! I love it! He’s so mad! “Scrappy” is the word I would use here. 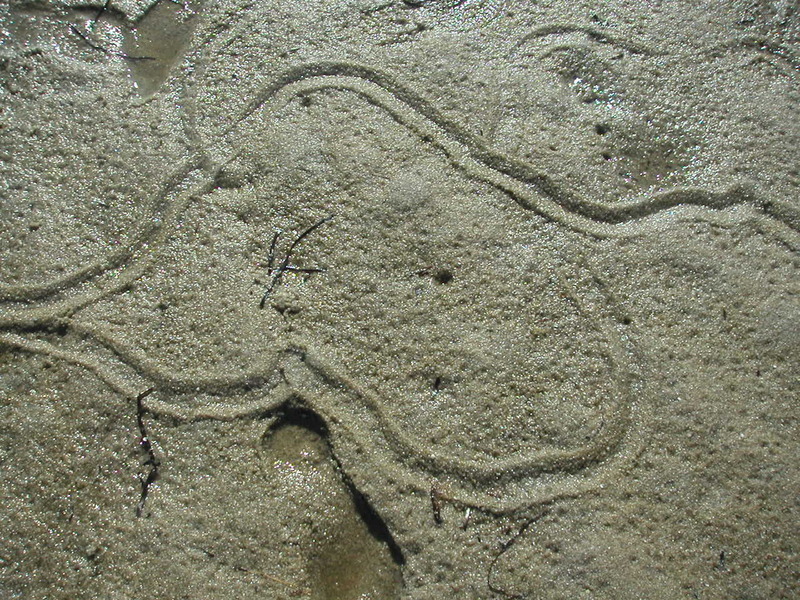 These loopy tracks could have been made by the Hermit Crab I found nearby, but it’s more likely they were made by a small gastropod, such as a New England or Mottled Dog Whelk. 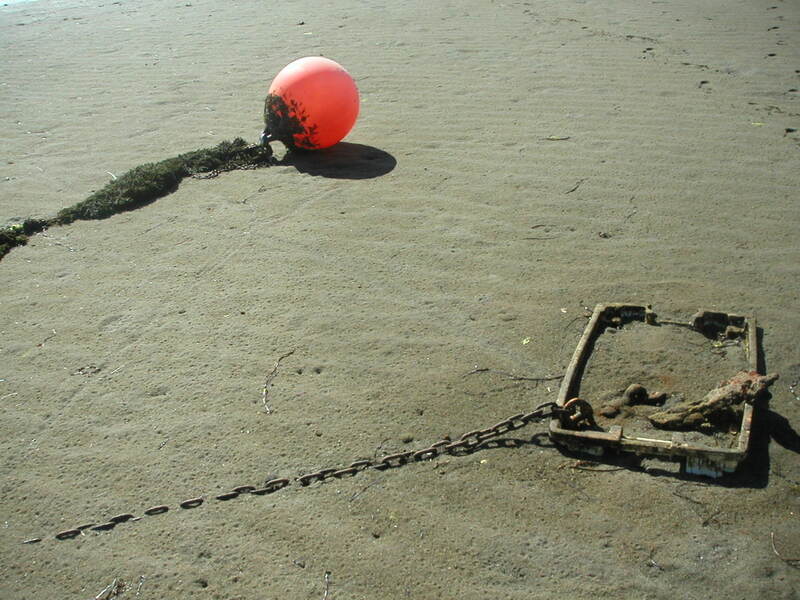 An anchor/float for a boat. When the tide pulls out, stuff like this just rests on the sand. It reminded me of something in a Dali landscape, so I took the picture. 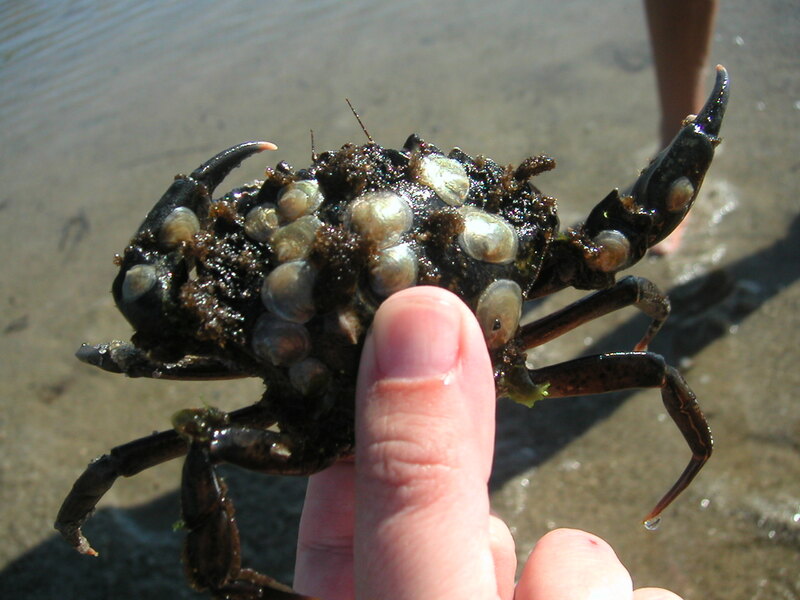 This baby female Green Crab is missing a claw. This female Lady Crab hid as soon as we put her in the bucket. 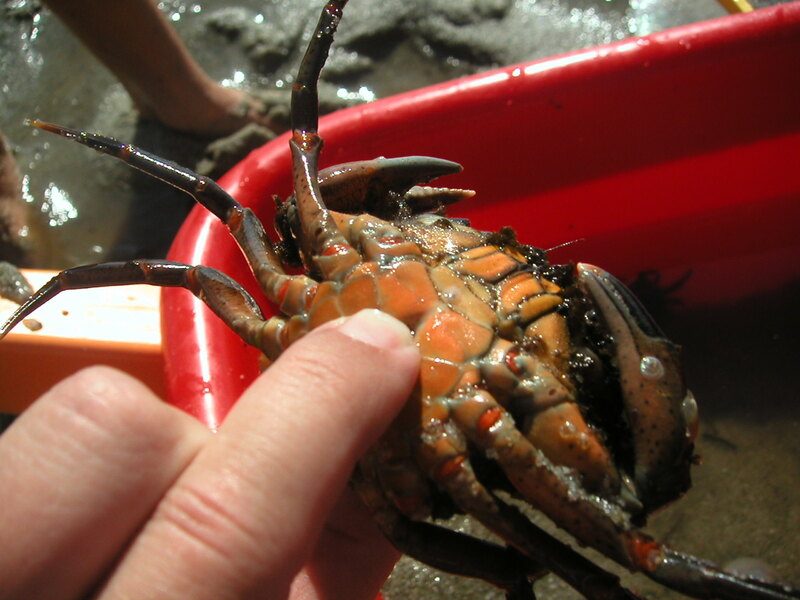 I stuck my finger in the water in front of the crab, and out came her claws in defense. She is pissed off. 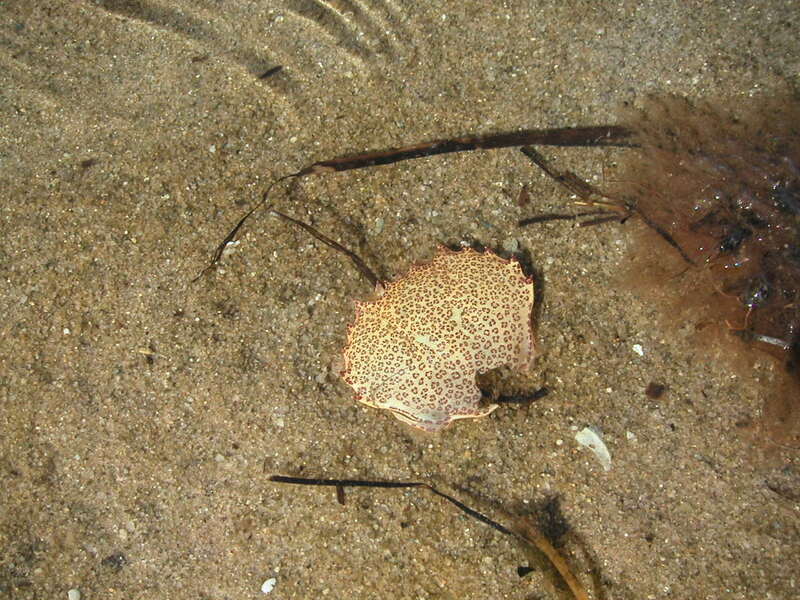 A Lady Crab carapace and two Clearnose Skate Eggs. I found these on the beach on Provincetown on April 4, 2010. 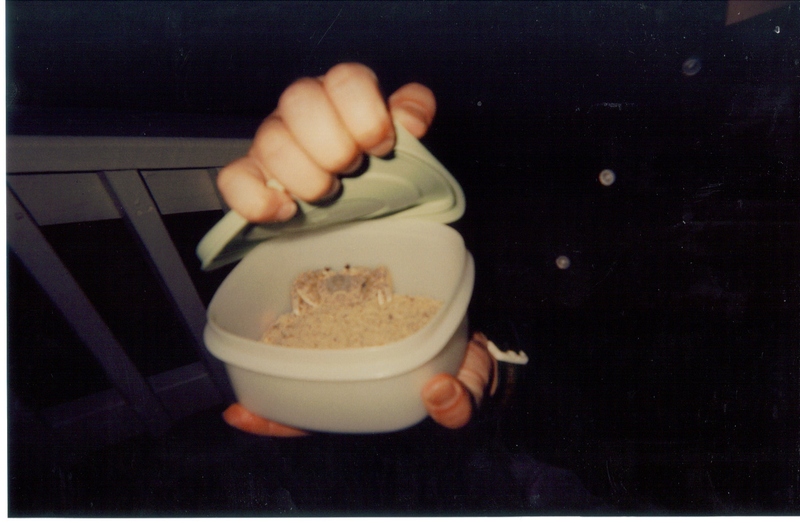 April 4, 2010, Provincetown: I picked up that Lady Crab carapace and cleaned it out so I could keep it, but it was so fragile it broke in half. I kept these pieces in the jar. Crab claws I found on the beach in Provincetown, April 4, 2010. I’d say these belonged to a Lady Crab, but they don’t seem long and thin enough, and they’re also too long and thin to be from an Atlantic Rock Crab, even though the coloring and pattern for an ARC is consistent. If I had to guess, because of the shape and the fact that they’re uneven, I’d say this is a type of Mud Crab with which I’m unfamiliar. 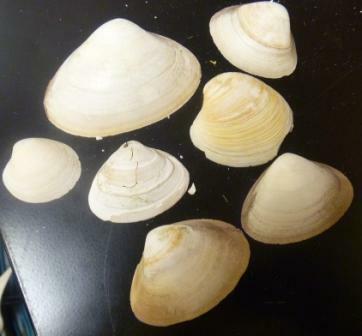 Several clam shells I kept in the ball jar. Again, clams are a weak point for me (well, other than EATING them!). There are probably a few different species here. If anyone wants to take a stab at identifying all of them, please do. Put some stuff in my comment fields. 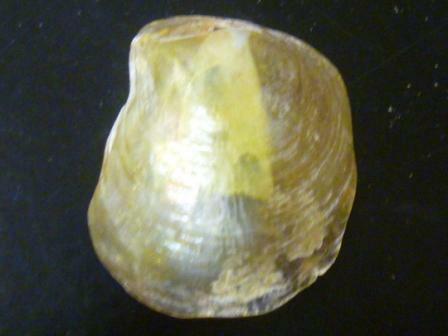 Shell for the Common Slipper Snail (Crepidula fornicata). 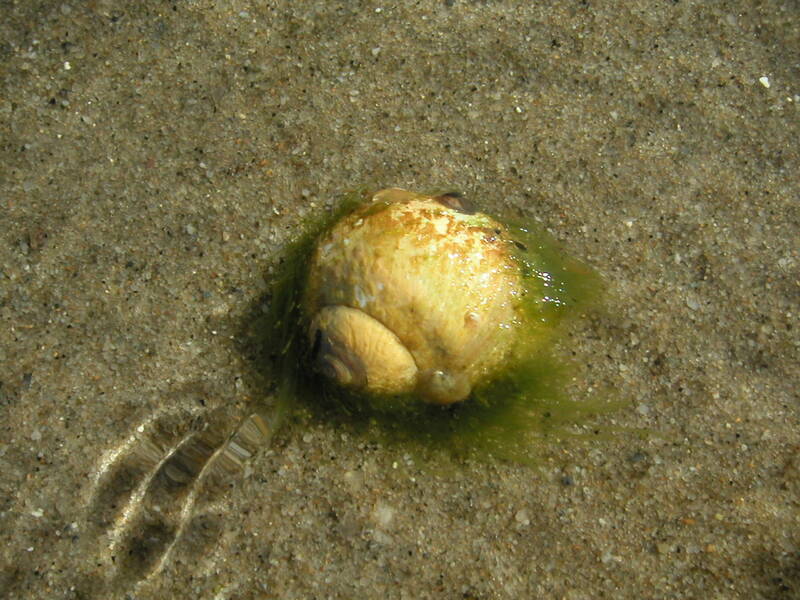 I can’t even tell you how many inside jokes there were about “fornicata” in this poor snail’s scientific name. If you’re wondering about that, I’ll tell you: it’s because these snails stack on top of each other and pretty much it’s what they do all day. 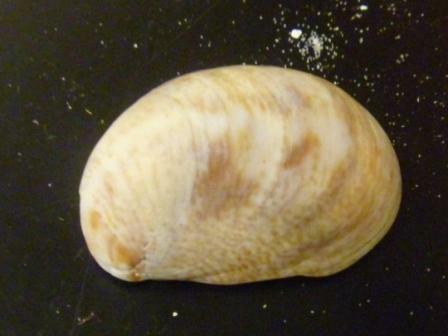 Larger shells are on the bottom, smaller ones on the top, and if I remember correctly, they can change sexes. I’d have to look it up again to be sure, but that’s what I remember—unless I’m confusing it with something else. I have a lot of facts in my head and sometimes get them mixed up because it’s been so long since I lived and breathed this stuff. 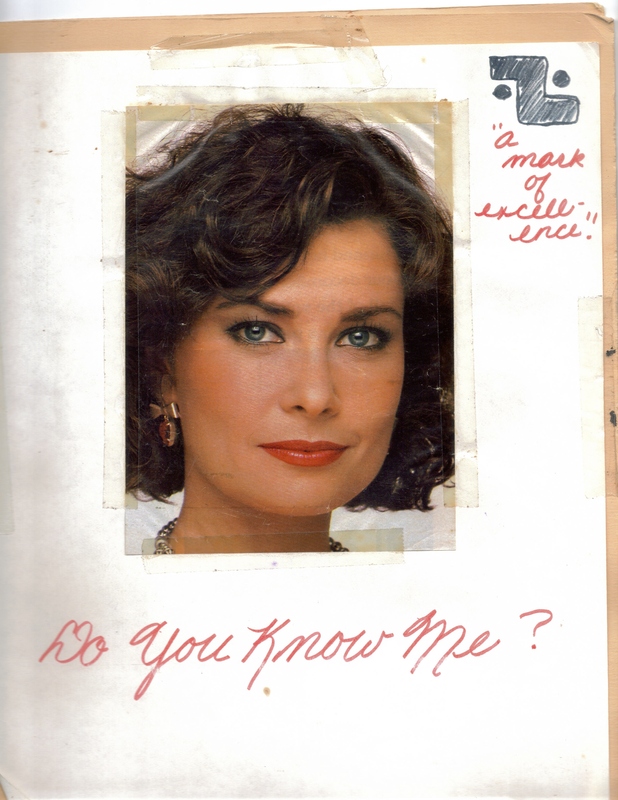 I’m surprised I remember all the Latin, to tell you the truth. 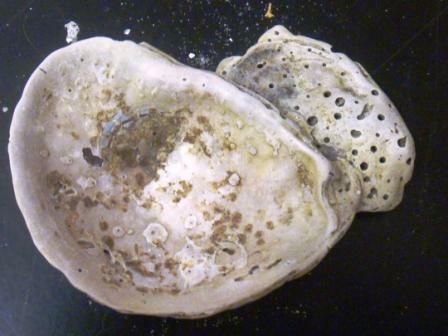 This is an older oyster shell, I think. 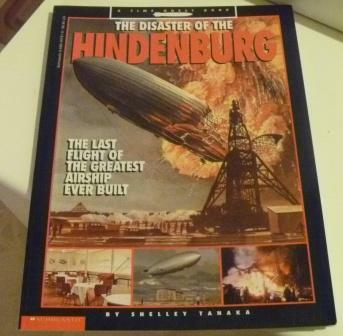 It’s pretty badly damaged. If anybody can tell me what this is and why it looks like this, I’d appreciate it. I will be on The Sheena Metal Experience TONIGHT on LA Talk Radio at 8 p.m. ET/5 p.m. PT. 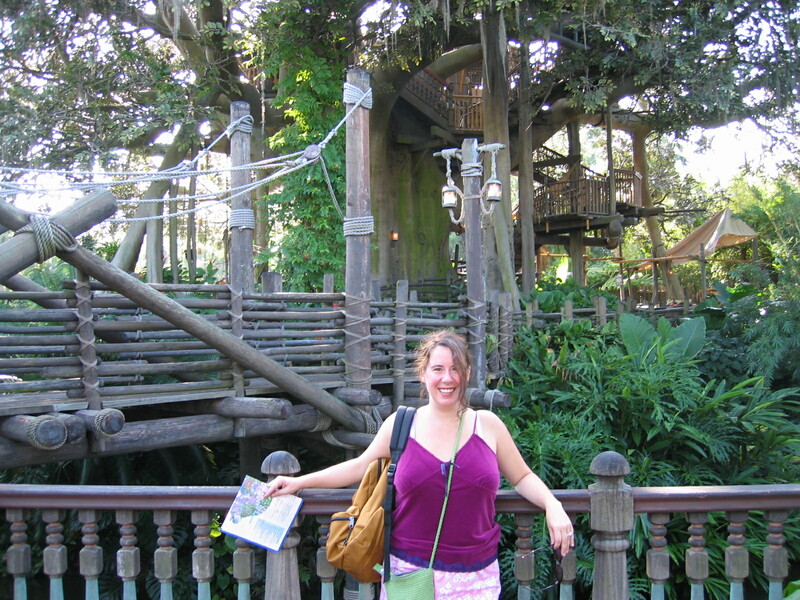 I’ll be discussing ghosts and Disney and probably bunches of other fun stuff with Sheena, who’s an awesome host. 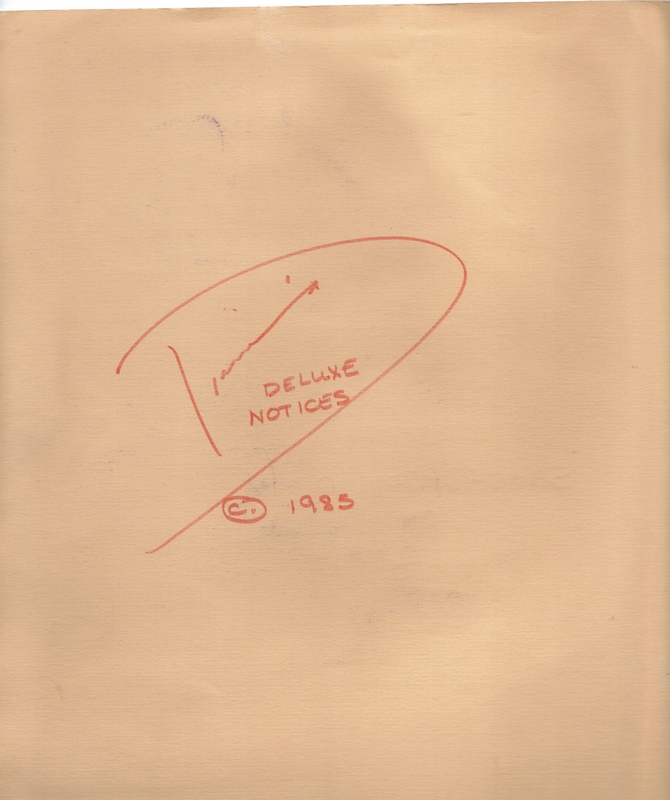 If you can’t listen in, I’ll be keeping you posted on where you can hear the archives. LIKE THE MOVIE TWISTER? 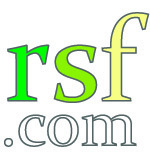 READ “THE SPIDER IN THE SINK” ON RSF! 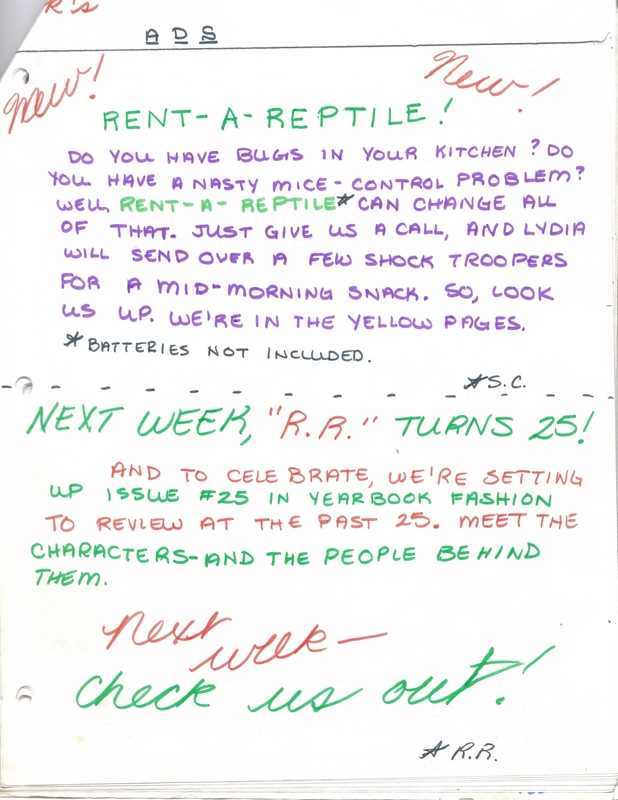 Jean Ryan’s short story “The Spider in the Sink” is now up on Read Short Fiction! If you are fascinated with storm chasing, tornadoes or are a fan of Storm Stories or Twister, then you’ll want to check this out. I was sucked in from line one, but the beauty of this piece for me was that I didn’t know from paragraph to paragraph exactly where it was going; I also am a fan of the second person POV as long as it’s done well: when it’s done well, it has the most haunting and almost ominous quality to it. 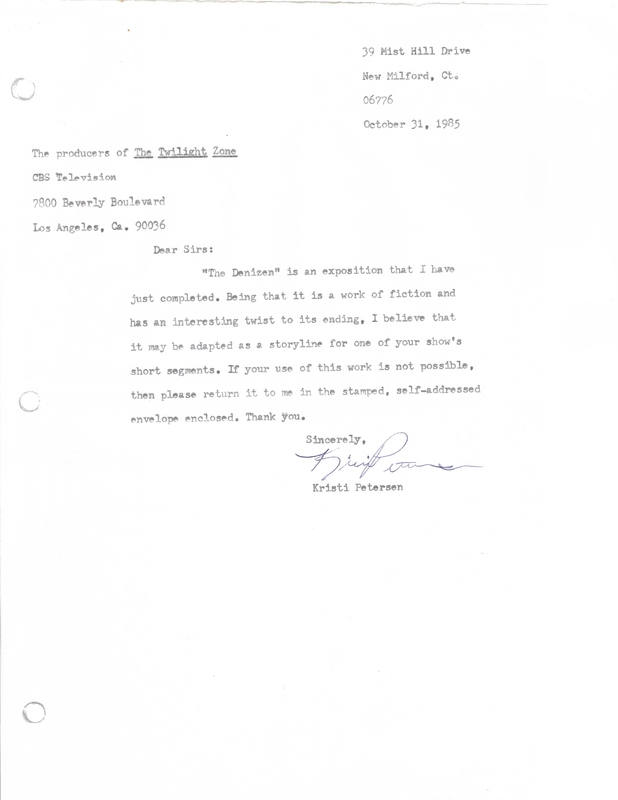 This is certainly one of the best pieces of second-person POV I’ve ever read, a true testament to the fact that choosing a POV for a story can make it a winner or a loser. In this case, it’s a winner. 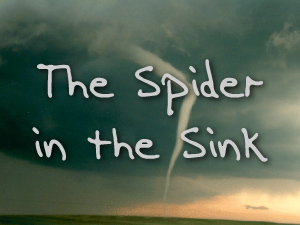 Also, the spider has long been a symbol of fate—and certainly, when we talk about tornadoes, there is always that element of fate involved (that line from Twister “You haven’t seen it miss this house, miss that house, and then come after you!” comes to mind).